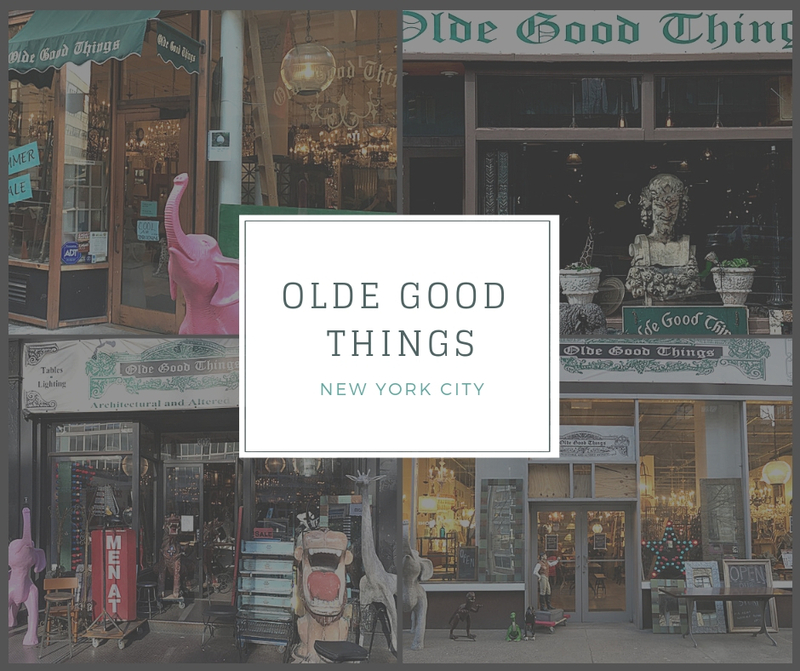 Olde Good Things had its mere beginnings in NYC during the heyday of the Chelsea Antique Market in the early 90’s and then opened its first retail store on Atlantic Avenue in Brooklyn in 1995. Today, 24 years later, you can visit our four brick and mortar retail locations, including one “pop-up” store at 71 Eighth Avenue between West 13th and 14th Street. 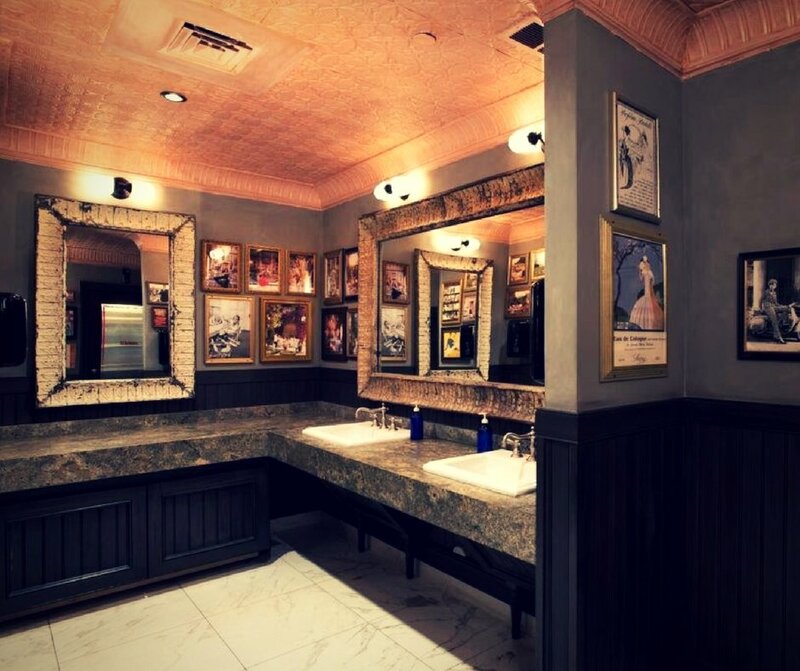 Visit each one location and see if we don’t live up to our “humble boast” of being “the most interesting stores in New York City!” Our largest New York Store located conveniently near Union Square. This store features the largest assortment of original hardware. 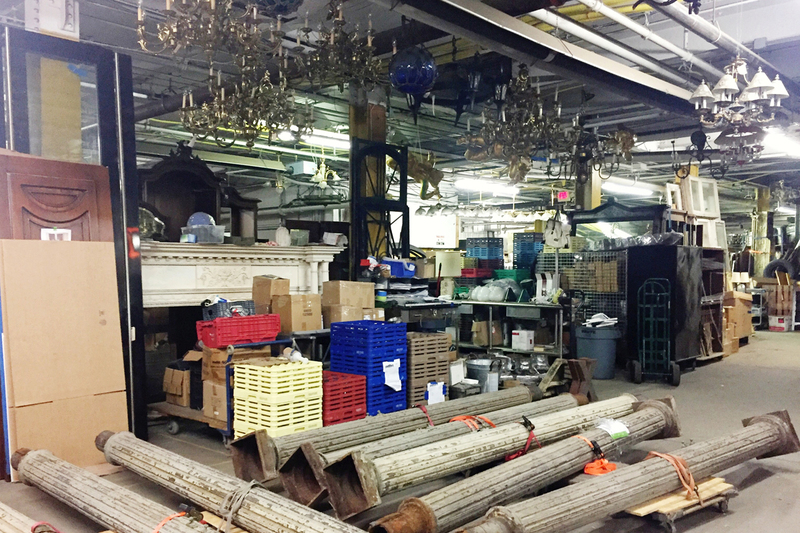 Our Upper West Side, Broadway location has the best assortment of marble mantels and large chandeliers and our Lower East Side, Bowery location has a wide assortment of smaller practical original lighting. Our pop-up store, 8th Ave has an interesting variety of decorative items and furniture. Come see us at each location to get the full Olde Good Things experience! 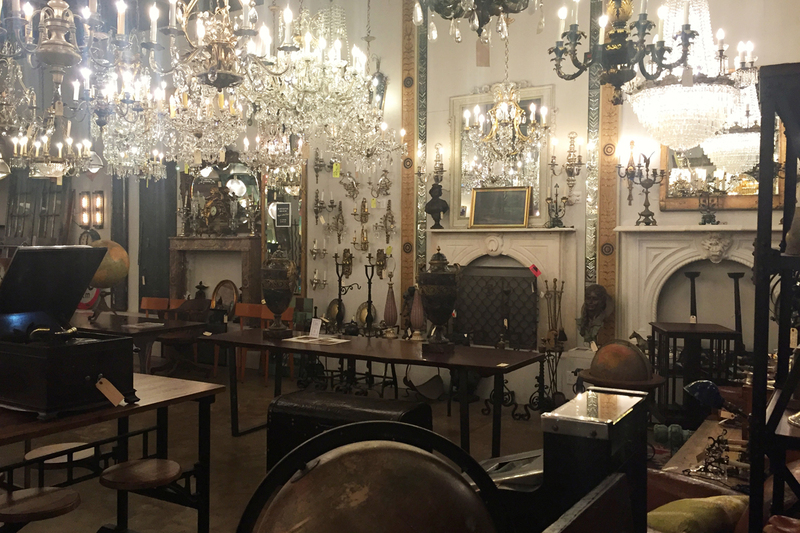 Each store has a personality of its own, with a variety of original lighting, architectural elements including mantels, doors, glass, hardware as well as our unique line of altered antique furnishings including mirrors, tables and shelving. 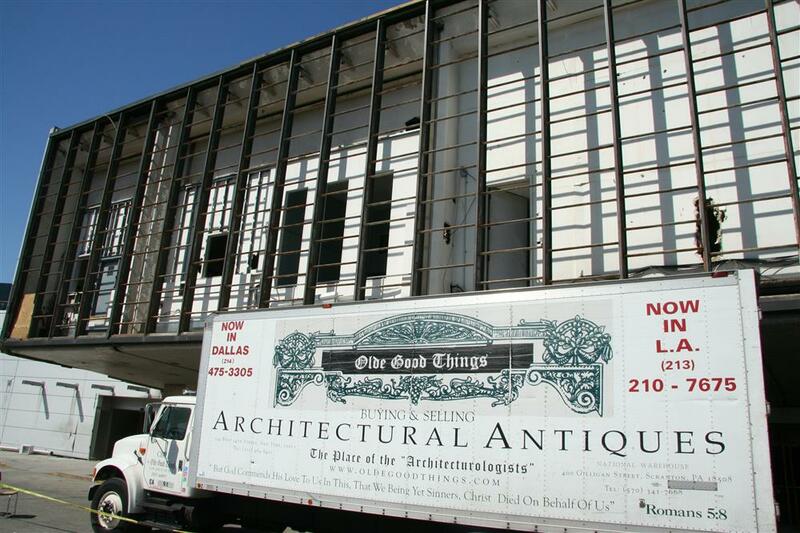 You will also find vintage, industrial and mid-century original furniture and decorative furnishings. Presently featured in each store is a wide assortment of items reclaimed from the famous Waldorf Astoria Hotel, which is now undergoing a major renovation. You will find from this New York City landmark, original marble and wooden mantels from for instance, the “Cole Porter Suite.” You will also find doors from the “Marilyn Monroe Suite” and lighting from almost every suite and hallway as well as conference and ballroom lighting including chandeliers from the Starlight Room. Kitchen and service items available including flatware, silver plated serving bowls and platters, many with the Waldorf signature. 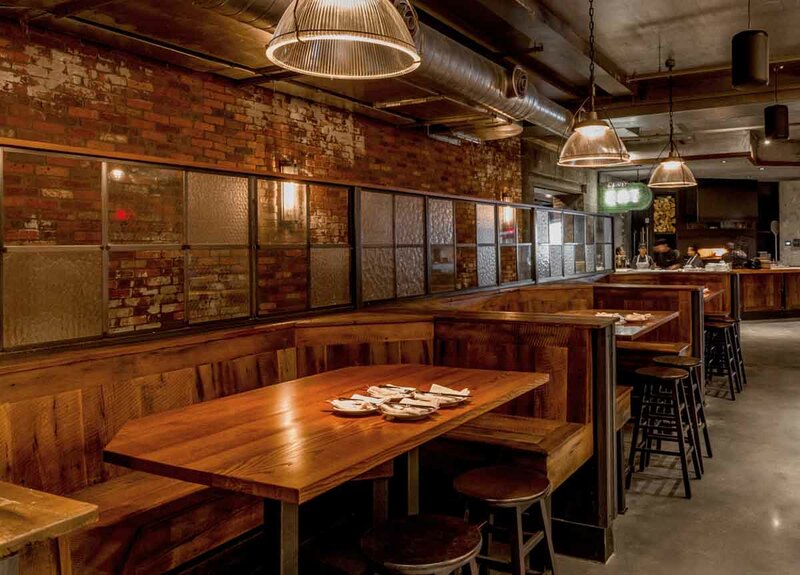 Special feature is the bar reclaimed from the famous Bull & Bear restaurant, if interested ask here. Too many interesting things to list! 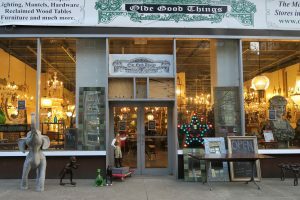 Olde Good Things also specializes in vintage wire glass reclaimed from windows and skylights of industrial buildings and skyscrapers. You will find samples of this glass at each of the stores. 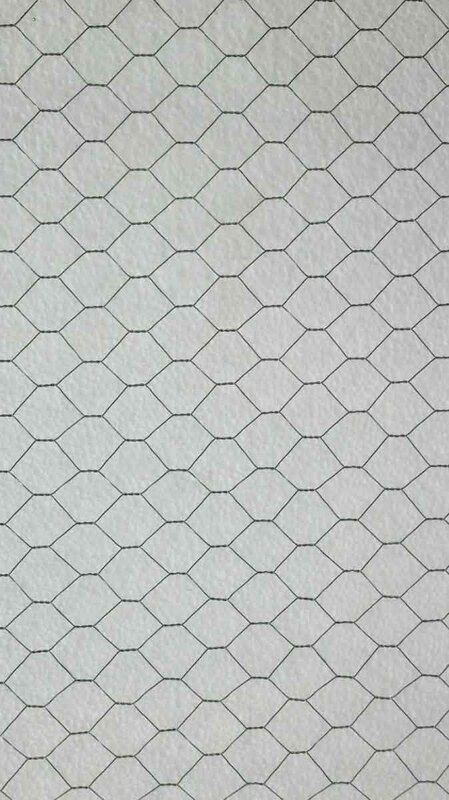 Special feature at this time is huge sheets (4 ft x 7 ft) of clear chicken wire glass from Rockefeller Center. Ask about our special service of frosting this glass as well. 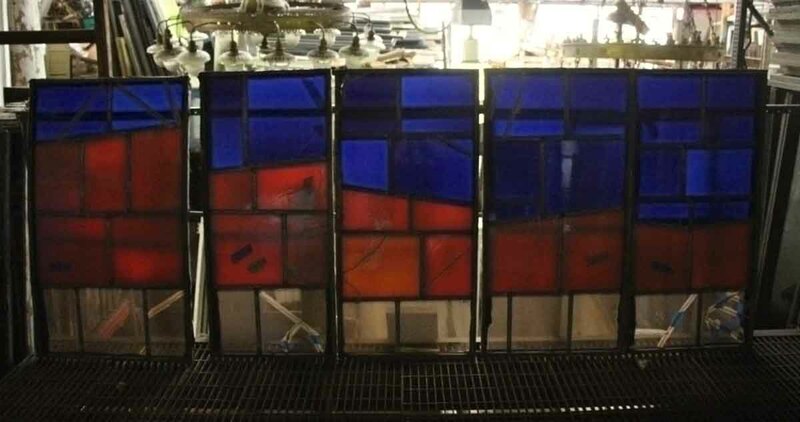 Visit www.oldegoodglass.com for more information. 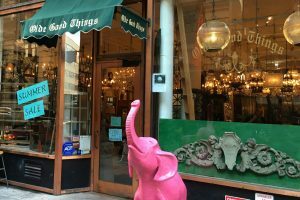 Olde Good Things has been reclaiming architectural items for a quarter of a century. 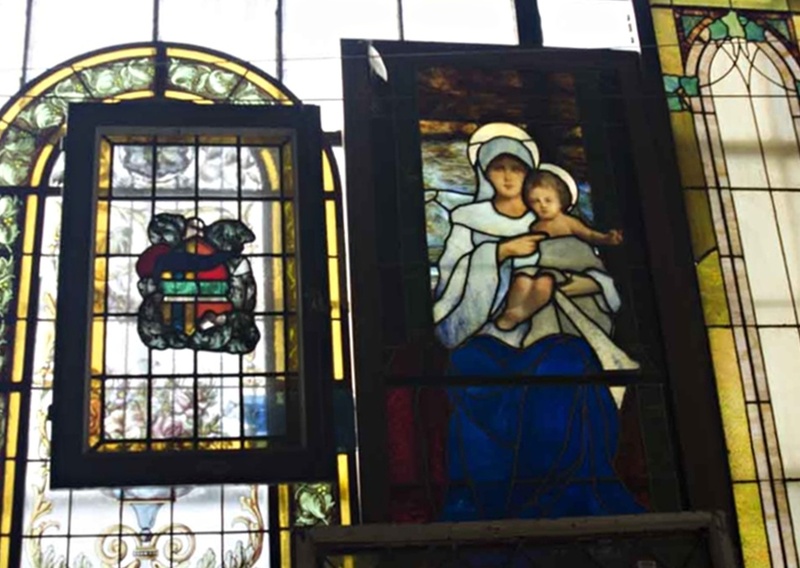 If you need doors, plumbing, stained glass, a special doorknob or plate, you could very well find exactly what you are looking for in one of these stores. 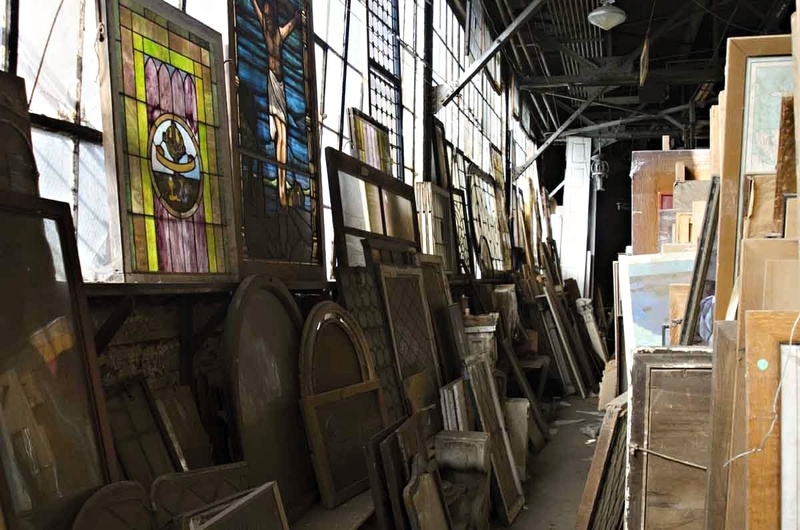 But if not, don’t be dismayed, we have two vast warehouses in Scranton, Pennsylvania chock full of every architectural item imaginable as well as an extensive website with over 16,000 items at www.oldegoodthings.com. 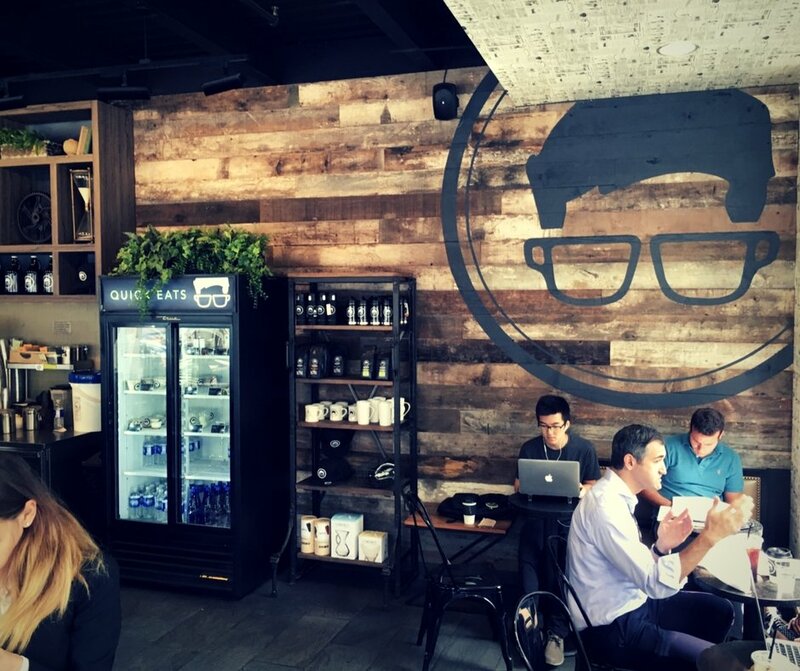 Your salesperson at the retail store, can help you find what you are looking for and possibly even arrange to bring it in on our truck that goes back and forth at least once a week. 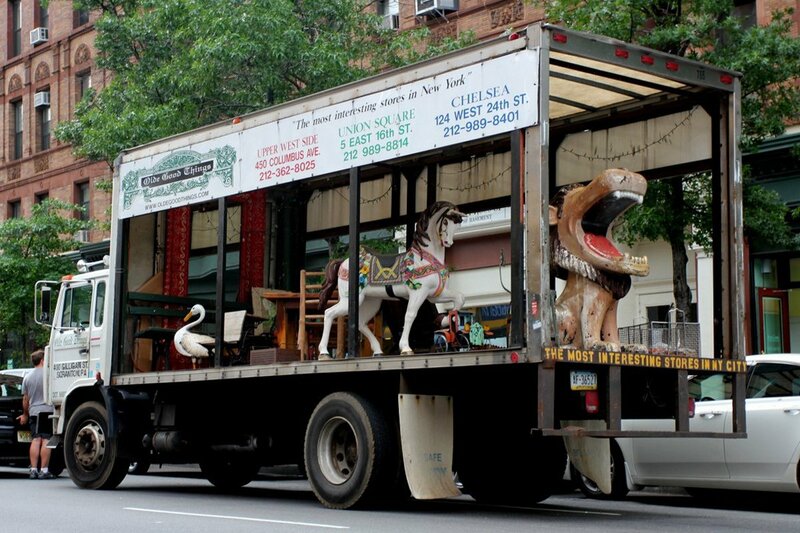 Have you ever seen the most interesting truck in New York? Follow the lion to one of our stores today. OGT bulk sale of the month! 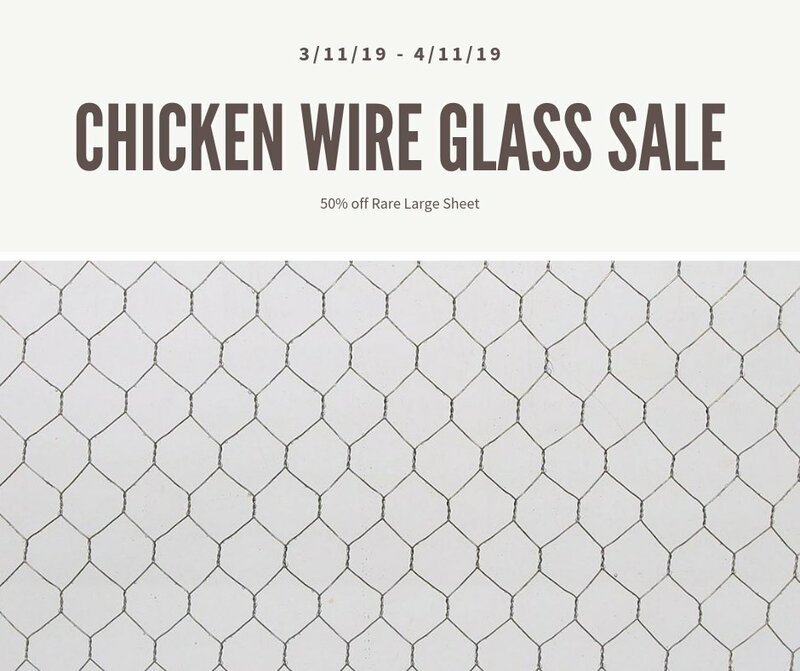 Clear vintage chicken wire glass now slashed to 50% off the retail price to $15 per square foot. 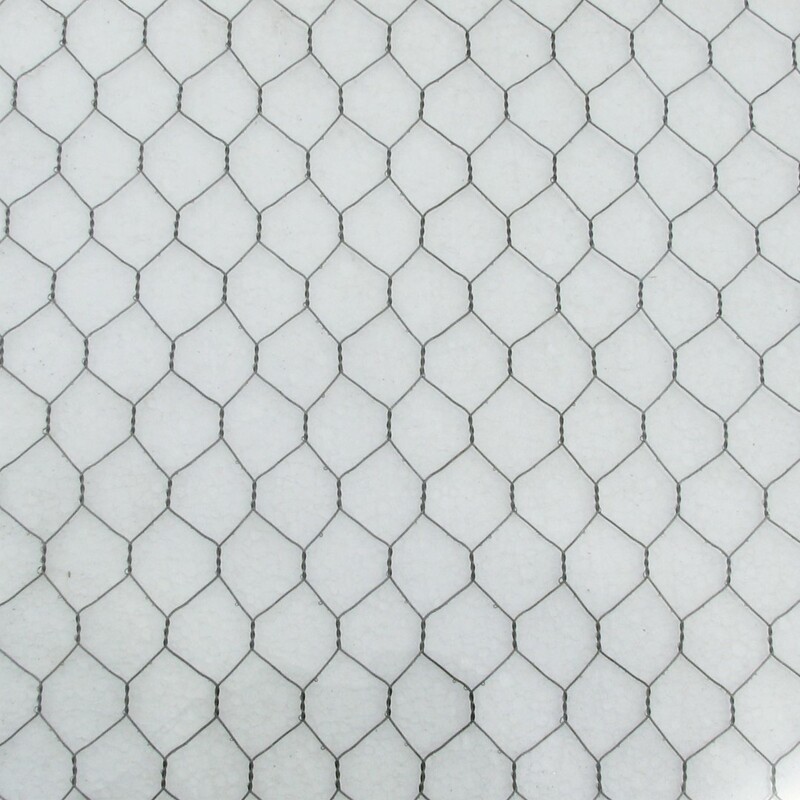 We have unusually large sheets of clear (no texture) vintage chicken wire glass, up to 53 in. wide and 81-3/4 in. tall. For the next 30 days take advantage of this amazing offer! Glass is sold ‘as is’. Cleaning, cutting and crating are extra. Sale ends April 11, 2019. Those who look into the soul of any vintage item will see beyond its form and function and into the life it should have going forward. Vintage glass allows the viewer to look through into other worlds and imagine things that used to be on the other side of the pane. 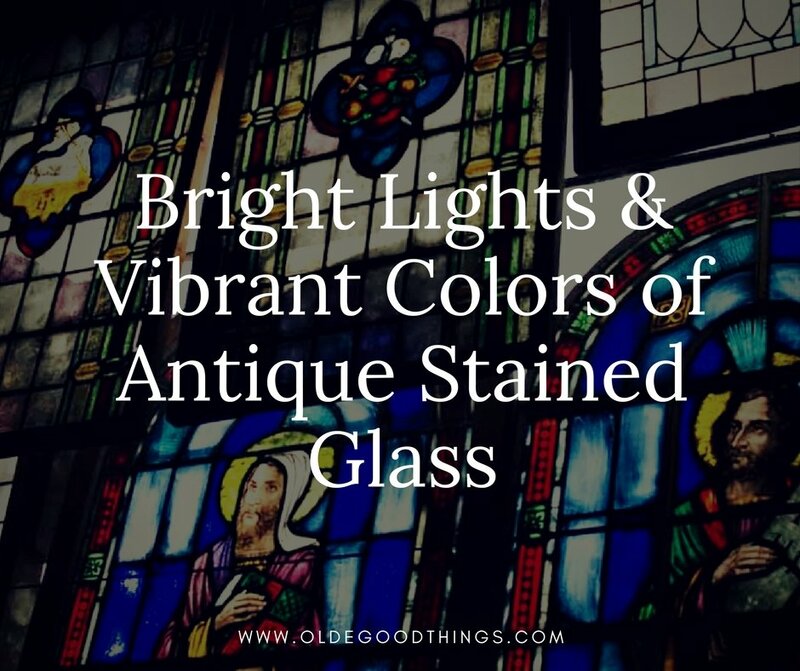 Next time you need something to decorate the interior or exterior space of your house, turn to Olde Good Things for your classic touches of style and history. A hint of the past is always a great way to move into the future. The past represents a groundedness that is not found in modern mass-produced-in-China items that overflow the shelves of décor stores. Impersonal, cold, and often too cheap to be worth passing along to the next generation, these items succumb to the decay of time. 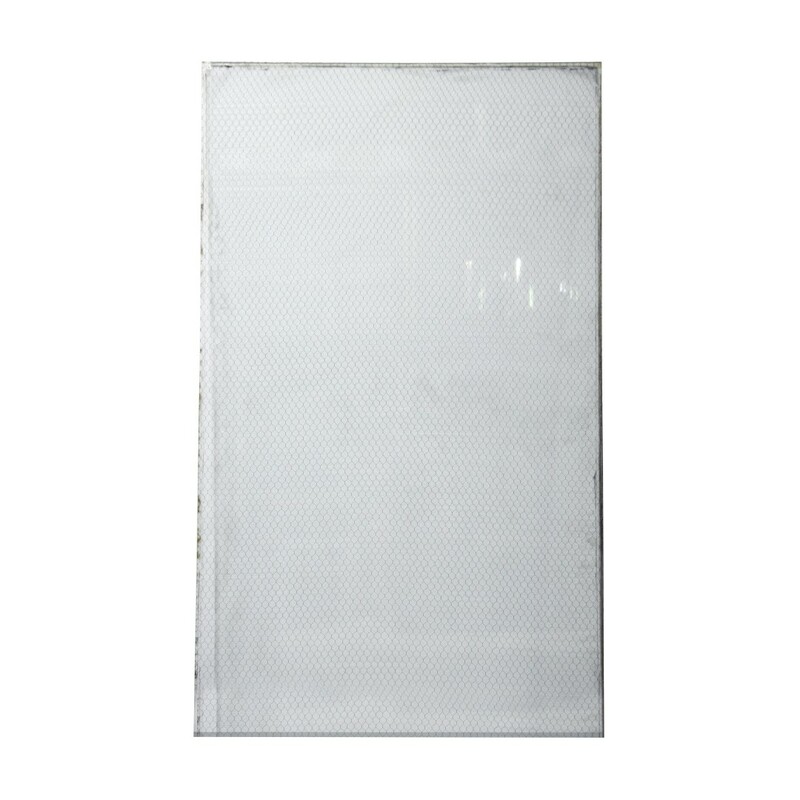 We have the largest selection of vintage chicken wire glass, including corrugated, pebbled, hammered, ribbed, wormy, and clear. We also have many types of obsolete textured glass, antique pattern glass, and wavy window glass. 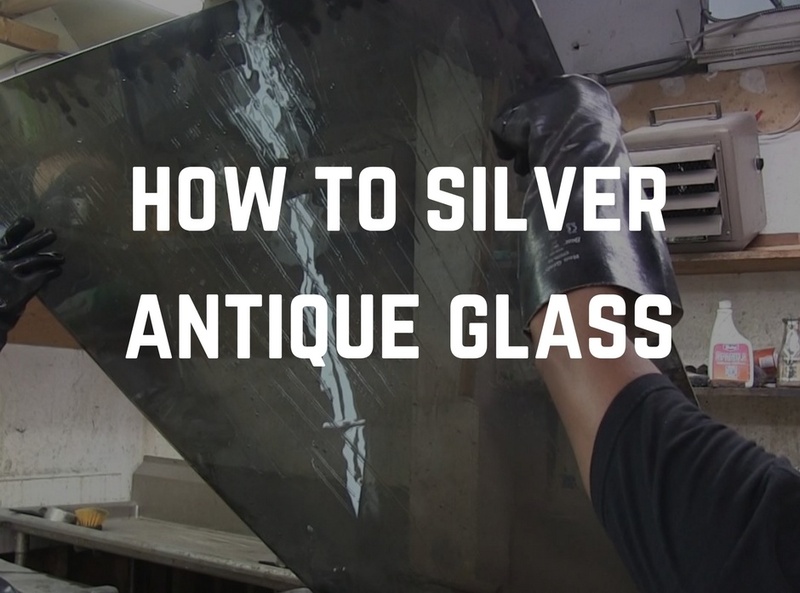 We have developed a unique process of creating the most authentic looking antique distressed mirror on the market. 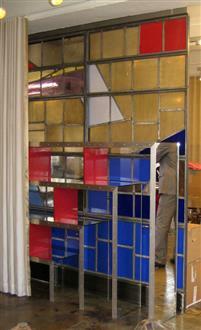 We have a full service shop ready to process your order of vintage glass and mirror. 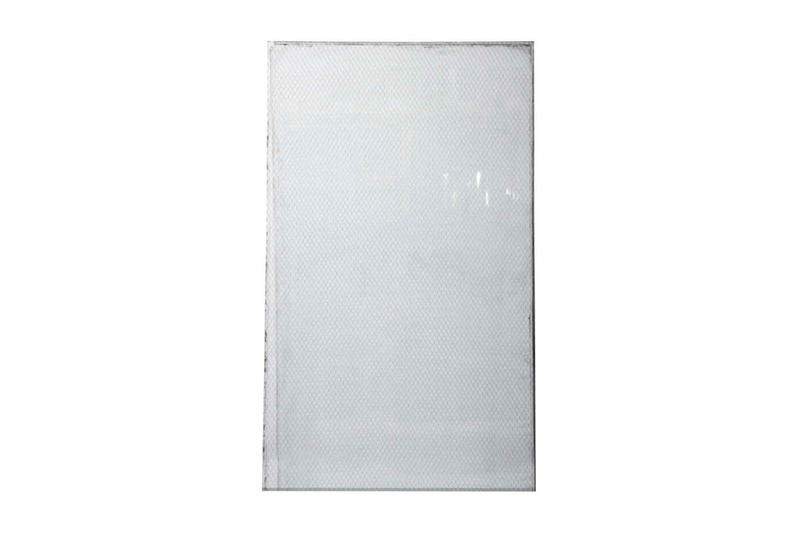 Rare Large Sheet of Clear Chicken Wire Glass – Limited quantity, pieces this large are rare. Each sheet is 28 square feet. Measuring 81.75 in. H x 49 in. W x 0.25 in. D.
View our customer showcases on our vintage glass website, www.oldegoodglass.com. Request a free sample here. 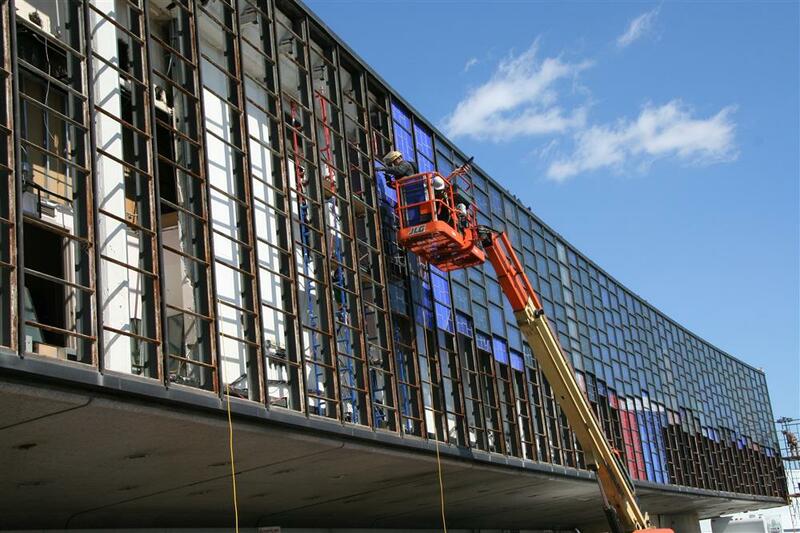 Architects and designers are always on the lookout for new trends in building materials and construction. Staying ahead of trends helps these designers create structures that will be both timeless and livable without having to do major improvements in the future. 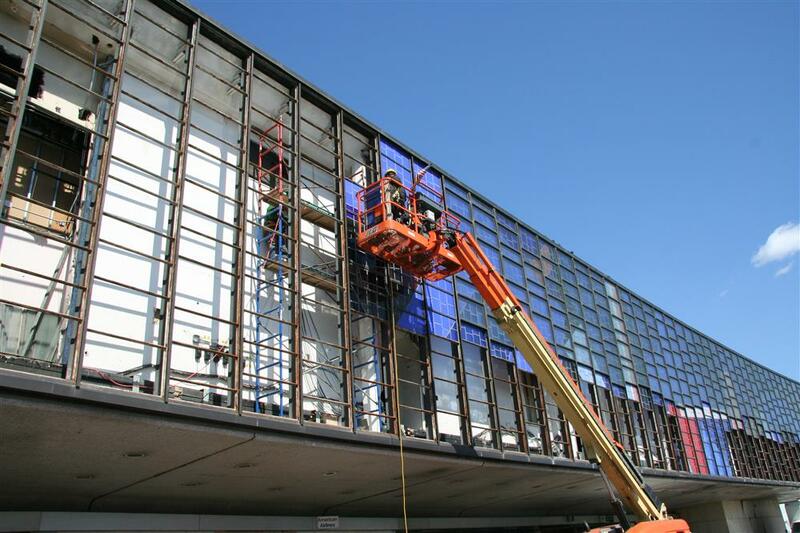 Not only must the designers consider the space in which they are building, but also the materials and what effect they will have on the overall construction. 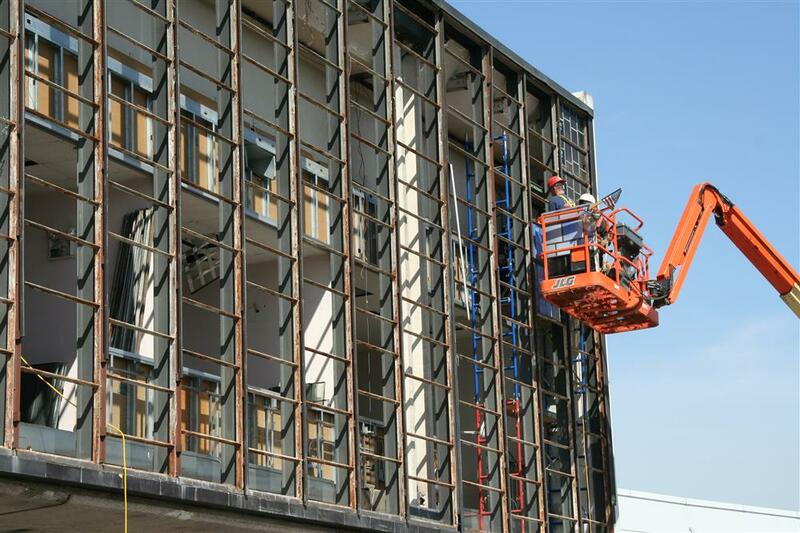 A hot trend that has taken hold recently in the design and construction industry is the use of sustainable, eco-friendly and repurposed building materials. 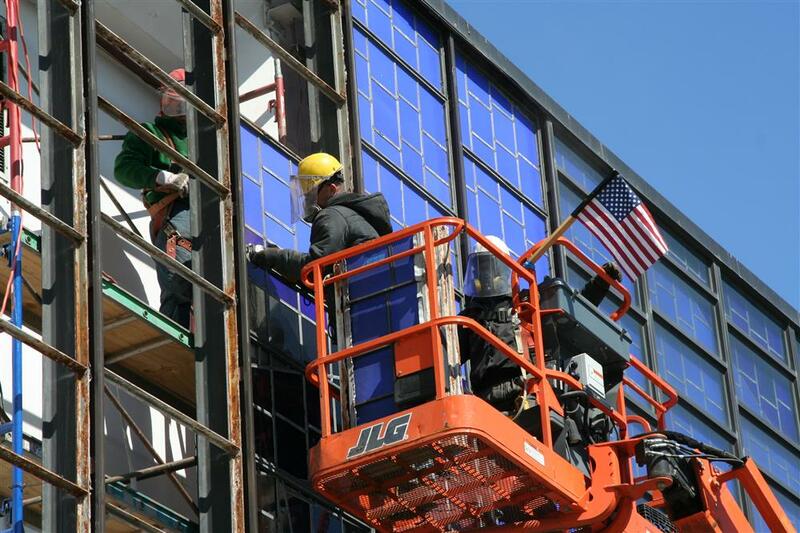 Designers, architects and even home DIYers are beginning to understand the impact that “new” construction can have on our environment and what they can do to help. 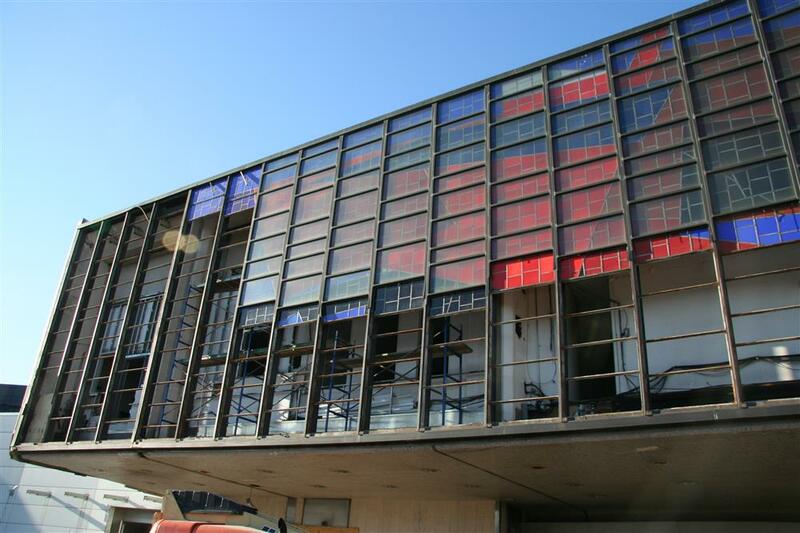 In another building trend, architects and designers are looking towards ideas such as adaptive reuse, where an existing building is deconstructed, the usable materials (like flooring, wood beams and antique lighting fixtures) are saved and the space is converted for a new purpose. 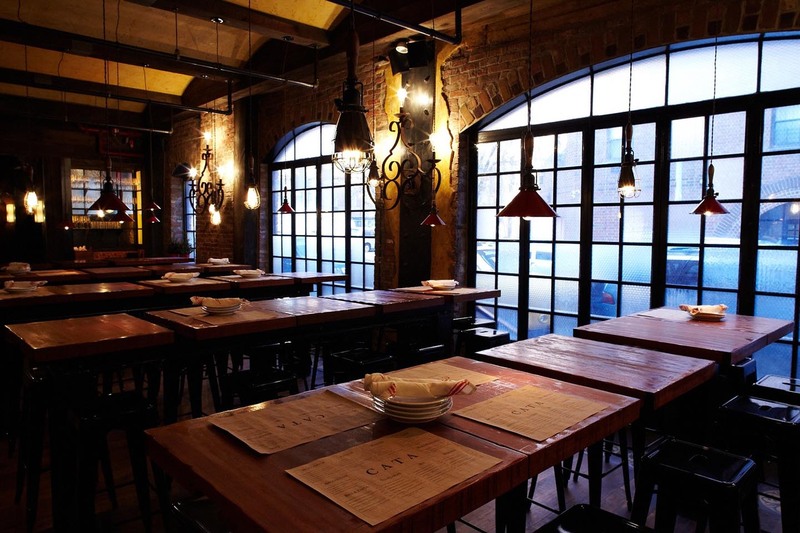 Factories, warehouses, and train stations are just several types of buildings that can be reused to house restaurants, apartments, or storefronts. 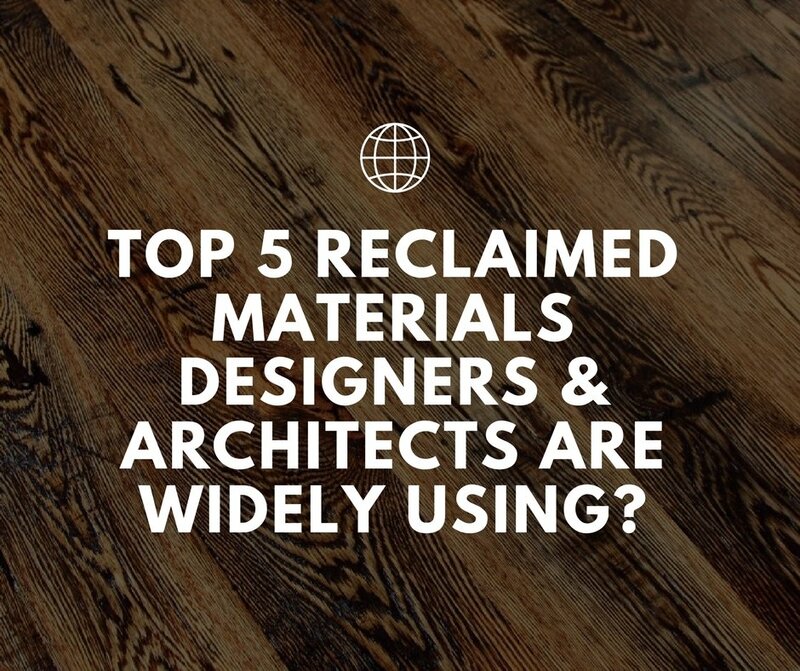 Utilizing the reclaimed building materials from these spaces can help cut construction costs and save these materials from clogging up landfills. 1. 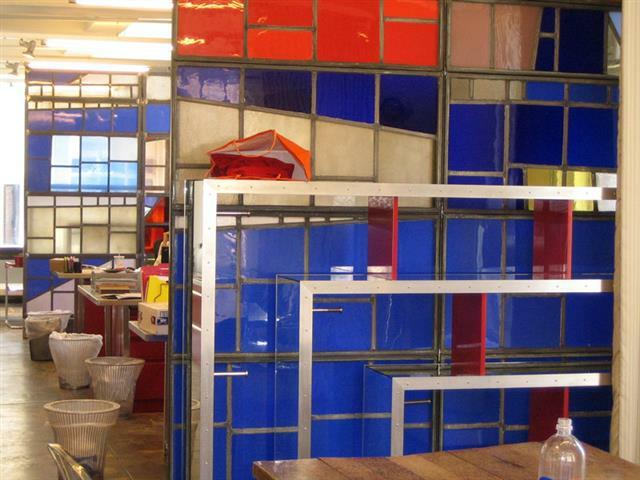 Vintage Wired Glass is now used in kitchen cabinets doors, room partitions or even made into mirrors. 2. 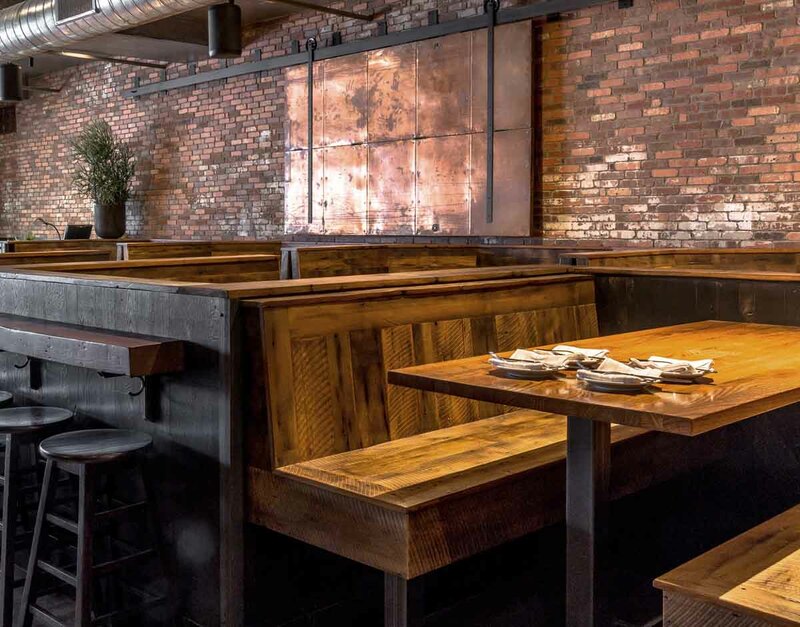 Reclaimed Wood Skins – Unique wall covering from the skins of reclaimed white pine floor joists. These planks are cut in various lengths and widths. 3. 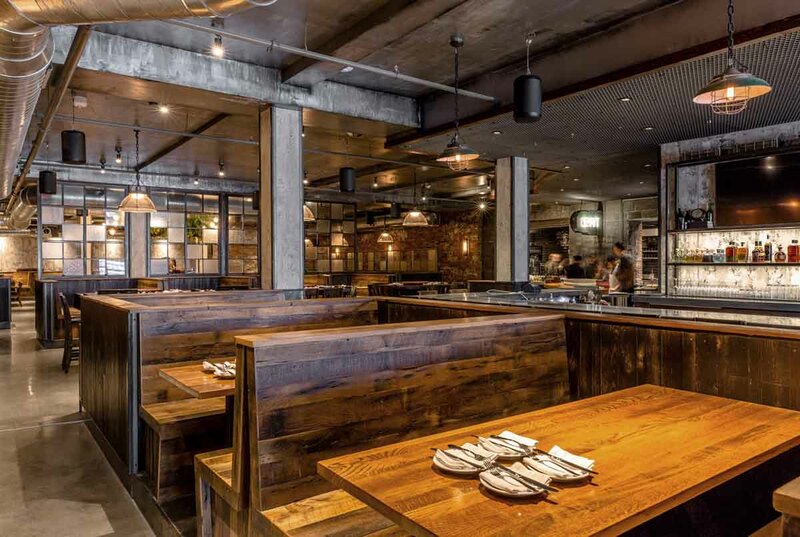 Reclaimed Wood Dining Tables – Reclaimed Pine, Walnut, Industrial Flooring, Oak, Bowling Alley & Ipe wood to choose from with a wide variety of bases to choose from. All tables can be customized to fit you space. 4. Industrial Factory Industrial Lighting – We salvage old factory pendants and restore them in our lighting shop. 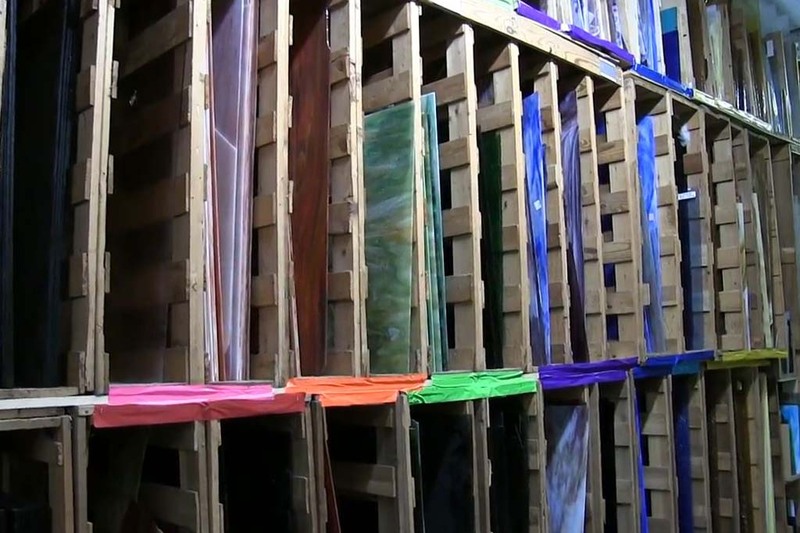 We have a wide variety of sizes available in large quantities. 5. 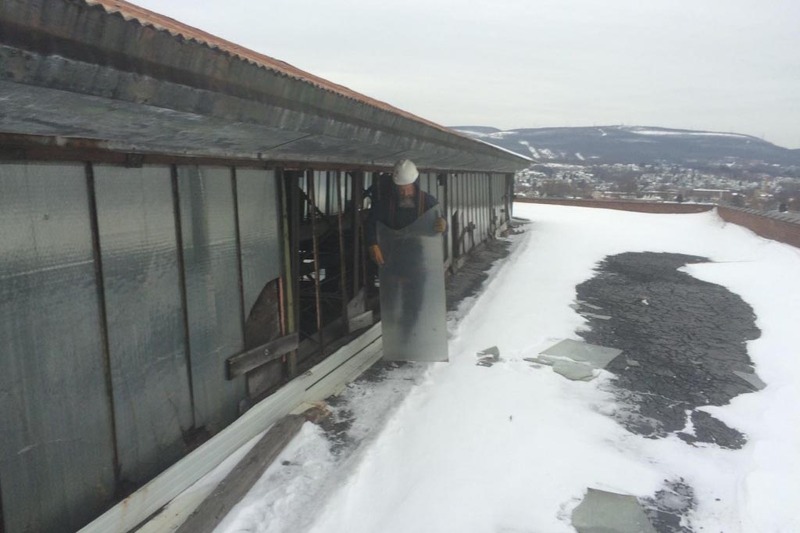 Custom Antique Tin Ceiling Mirrors and Panels – We salvage 100 year tin ceilings from old building and manufacturer it into mirrors and panels. 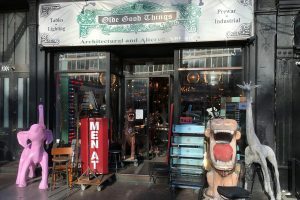 Olde Good Things is dedicated to discovering vintage finds and materials and repurposing, rebuilding, and reusing them into unique, handcrafted items. 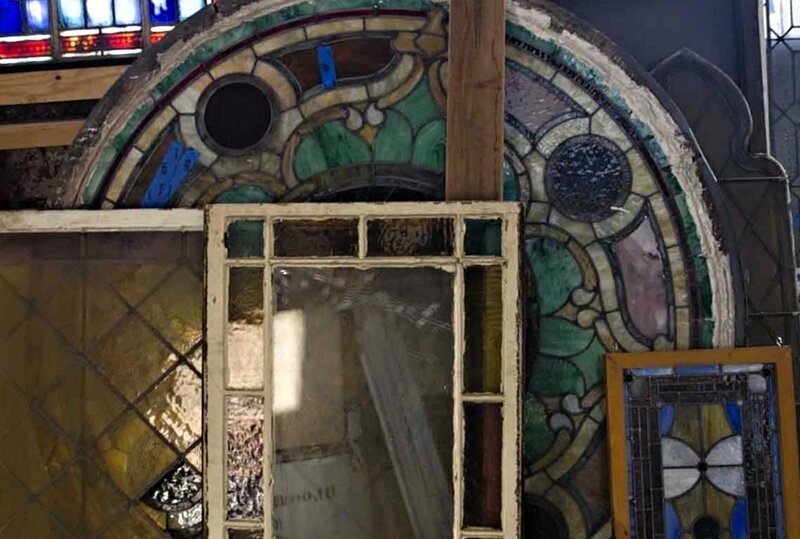 These reclaimed items are transformed into charming statement pieces for kitchens, dining rooms, offices, living rooms, bedrooms, home exteriors, and gardens. 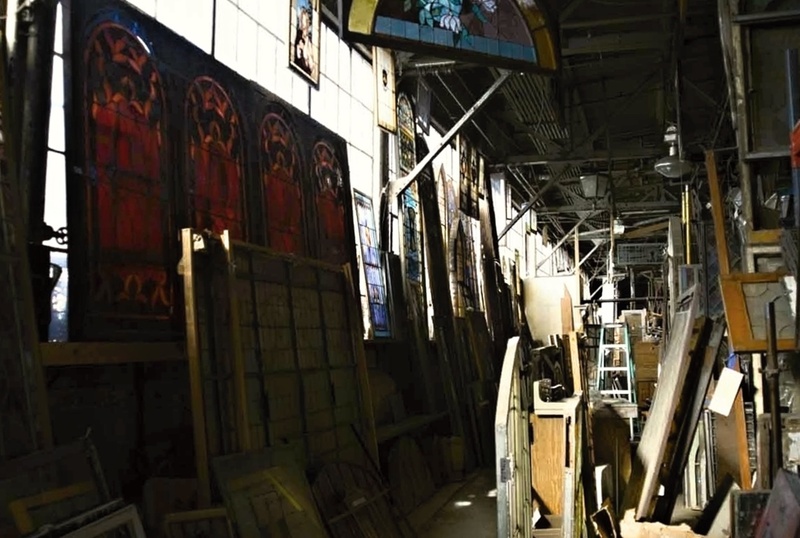 With over a quarter of a million square feet of salvaged antiques and reclaimed building materials, Olde Good Things is here to help in the search for the perfect antique or reclaimed piece. 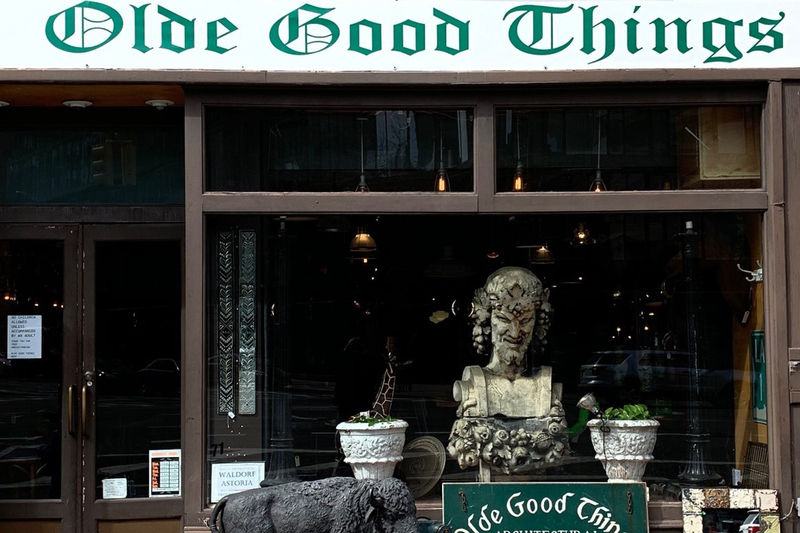 Olde Good Things has always enjoyed working with interior designers, decorators and those people who have a vision for how they want a particular space to work. 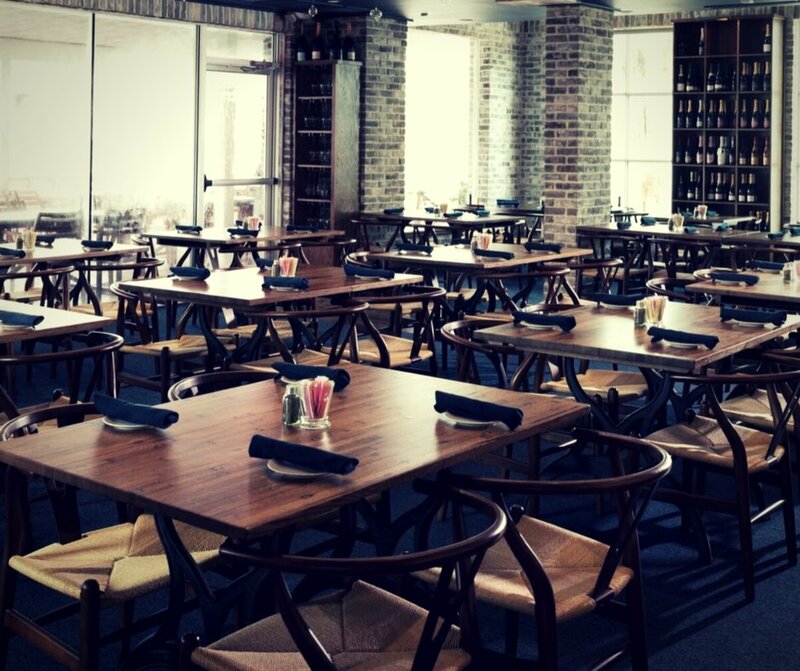 Some of our favorite spaces to work in are restaurants because the décor can completely transform a space, yet it should have a function. 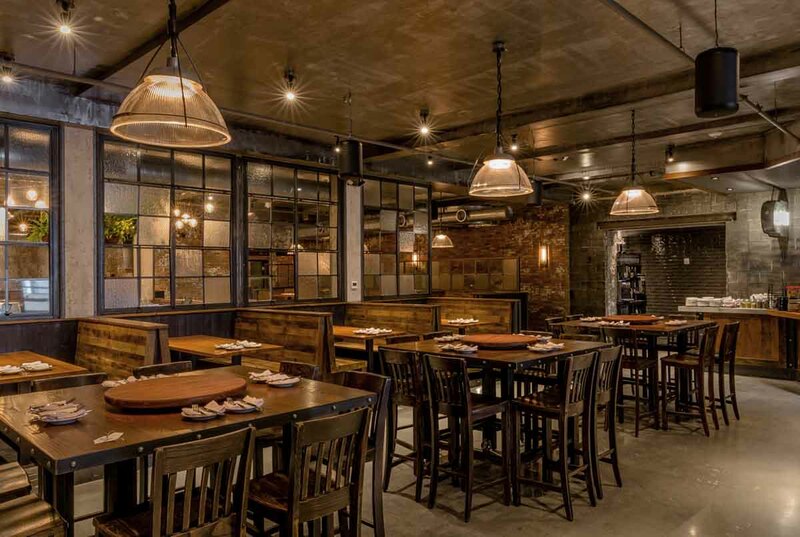 So, when Erica Diskin of Assembly Design Studio in Boston contacted us for items that would be used in a remodeled restaurant, we were more than happy to help. 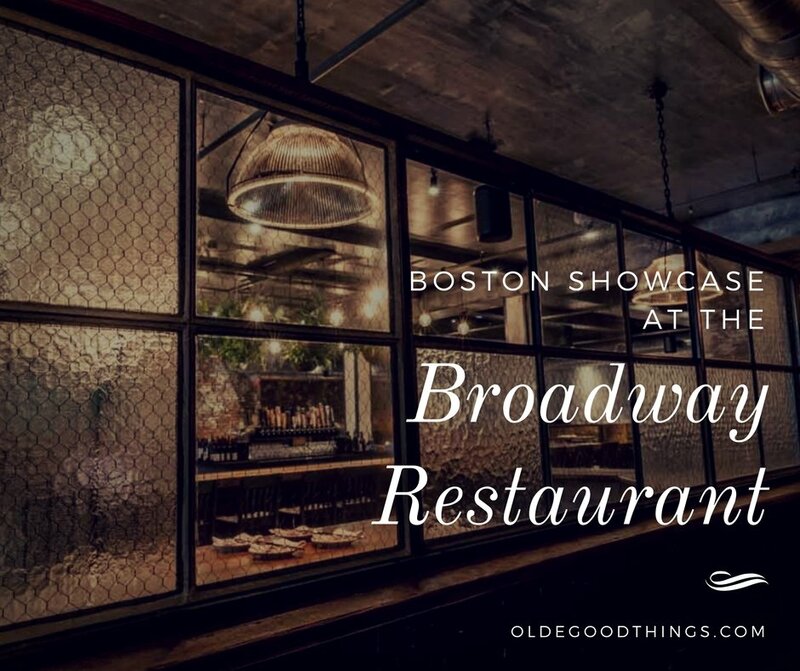 Erica and her team were tasked with creating the décor for The Broadway, a bar and restaurant in south Boston. 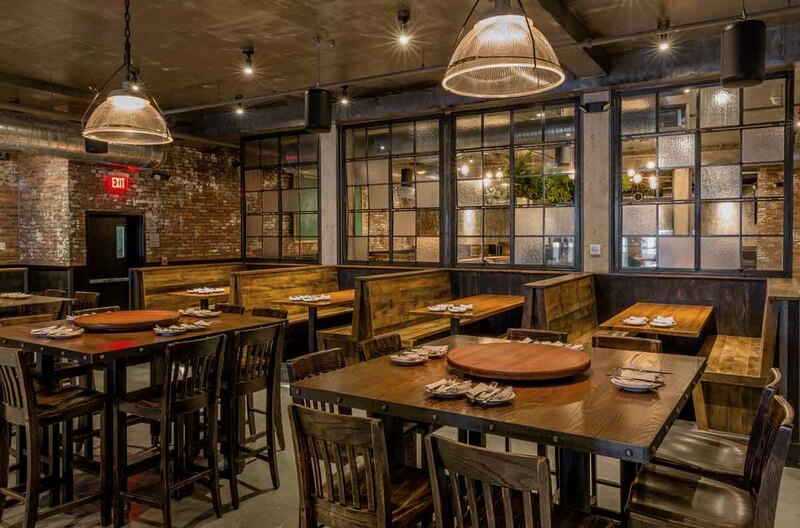 Formerly the Boston Beer Garden, restaurateur Joey Acari decided he and his team needed a change after having spent more than two decades inhabiting the space. 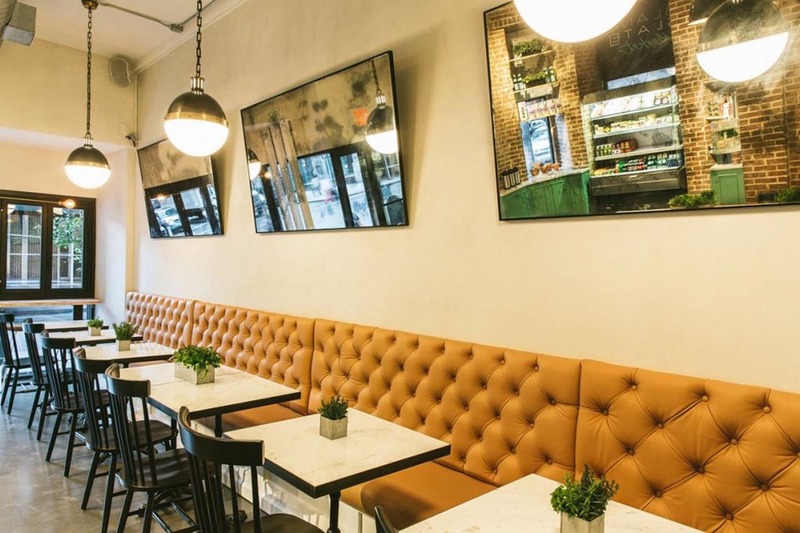 Acari has also converted another of his restaurants, the Playwright, into The Punk & Poet to try and keep up with the everchanging demands of the neighborhood. 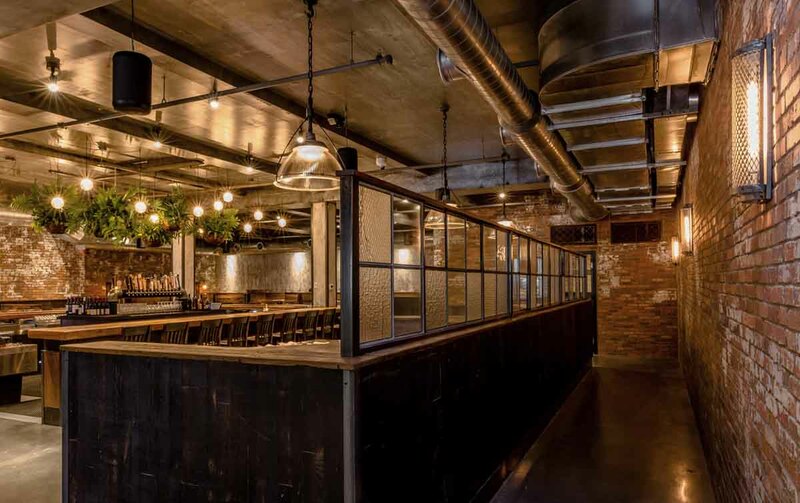 Featuring wood elements salvaged from Boston Beer Garden, subway tiles and steel accents throughout the interior, the décor of the Broadway is decidedly of an industrial influence. To help enhance this aesthetic, we worked with Erica to come up with items that would fit perfectly with this décor. 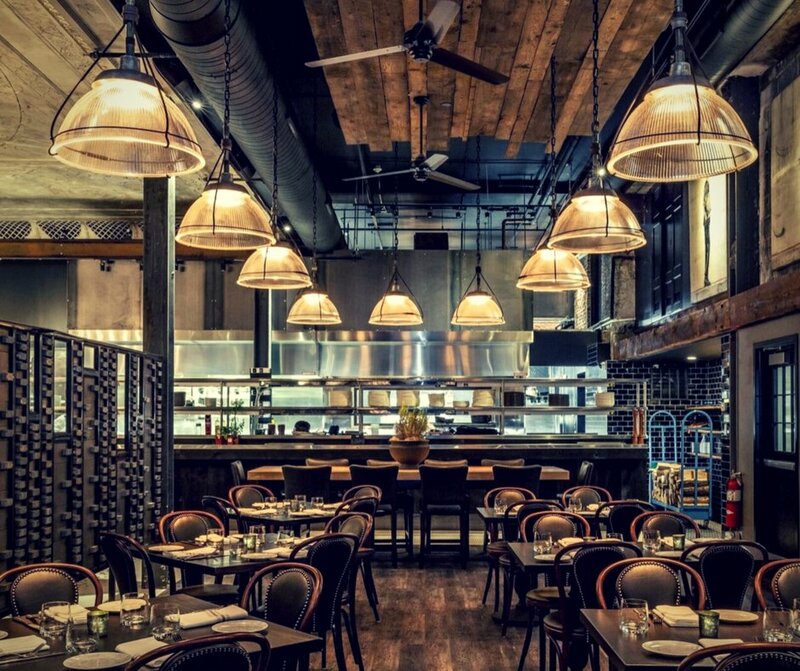 Holophane lights were used over tables and booths, while industrial style wall sconces were placed throughout the restaurant. 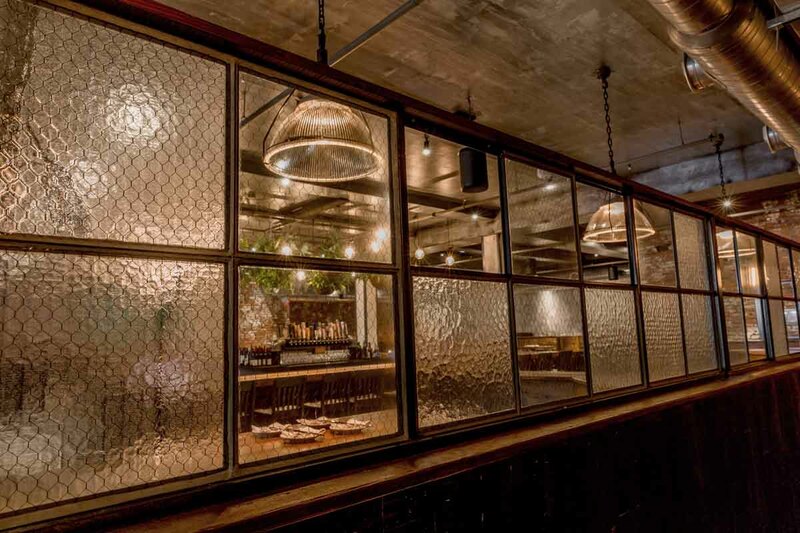 Chicken wire glass was used to create partitions to section off areas of the restaurant, while copper doors were used to ingeniously hide wall-mounted televisions when not in use. 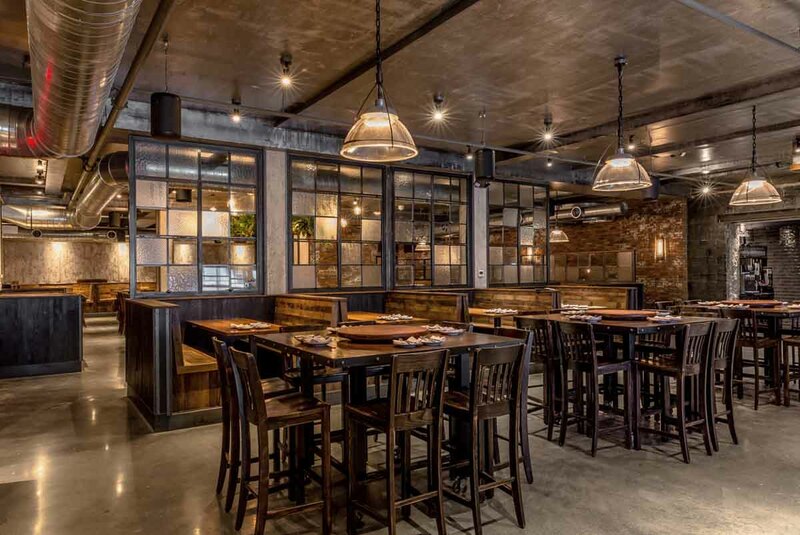 Opened on November 15th, Broadway features wide booths, communal seating and two bars within the restaurant as well as a packed menu featuring wood-fired pizzas and a cocktail list who’s highlight is a nitro cold-brewed draft martini. If you’re a designer looking for your next piece of inspiration, stop by any of our Olde Good Things stores in New York City or Los Angeles, our giant warehouses in Scranton, Pennsylvania or at our webstore ogtstore.com. We’re not only certain you’ll find the right piece for your next project, but we’ll also offer you 15% off your purchase. Call us or stop by, we’d be glad to help you. 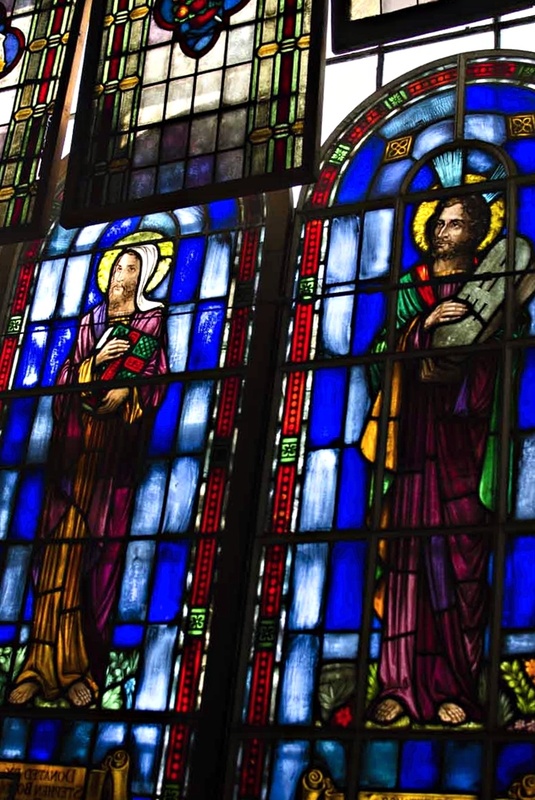 Stained glass windows are both stunning architectural features and awe-inspiring works of art. 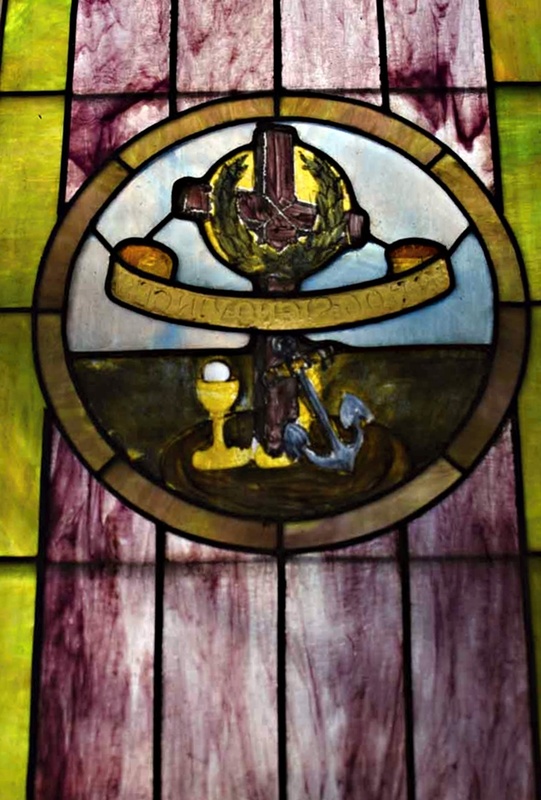 Traditionally made by adding metallic salts to molten glass to create colors and then blown or pressed into panels or shapes, these brilliantly colored windows can feature biblical scenes, animals and plants, landscape scenes, historical figures or abstract shapes depending on its intended use. 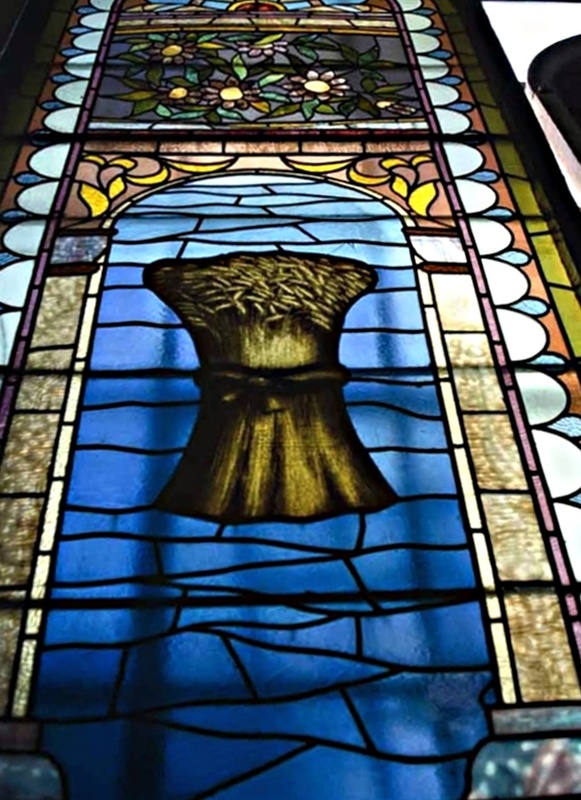 Throughout its thousand-year history, the term “stained glass” has been applied almost exclusively to the windows of churches, mosques and other significant buildings (such as government buildings) while a similar style, referred to as leadlight, was used primarily in homes and businesses. 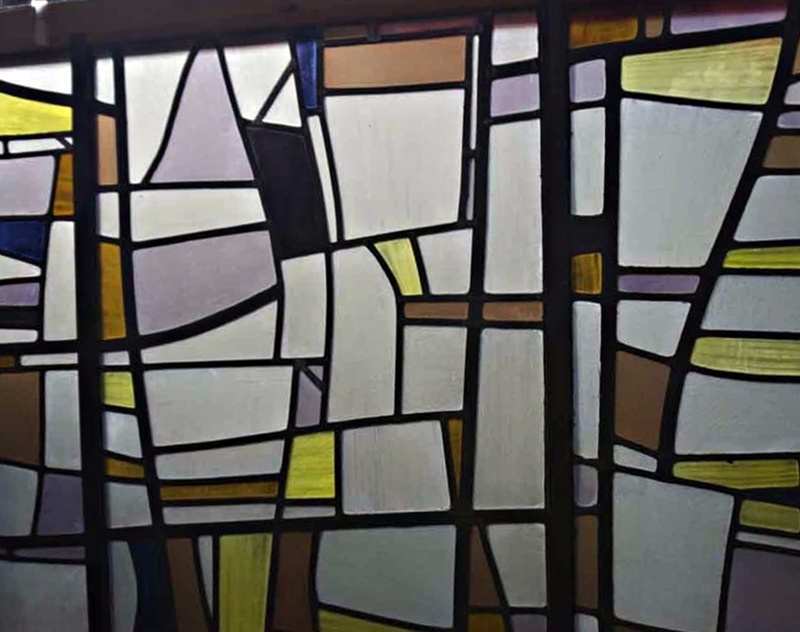 The major difference between stained glass and leadlight is largely in the manufacturing process and the more simplistic designs featured in leadlight. 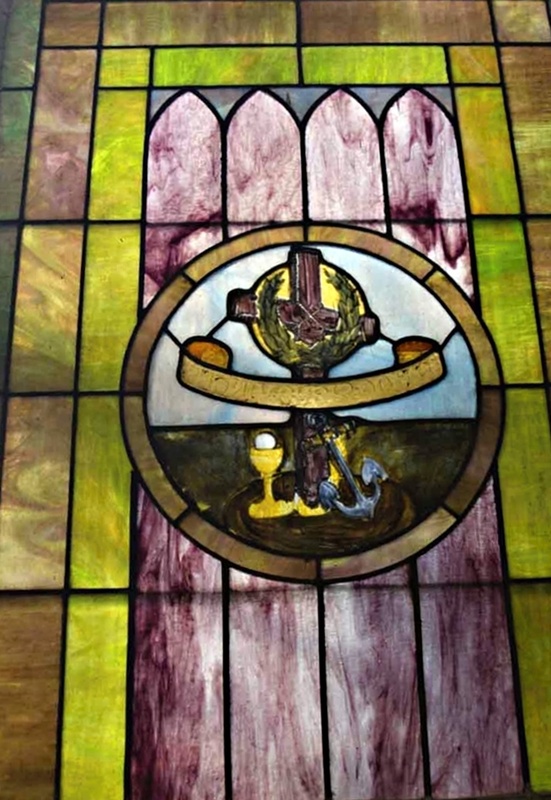 Stained glass windows, such as those commonly found in churches, usually include design elements that have been painted onto the glass and fired in a kiln before assembly. 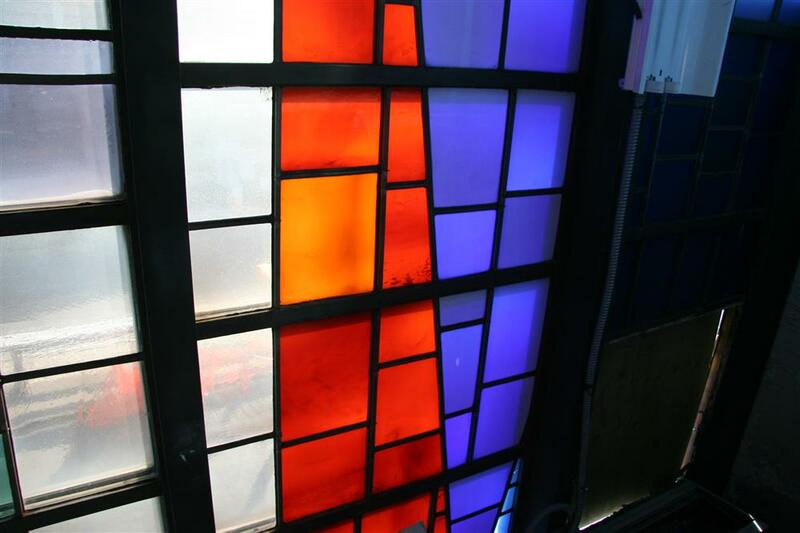 The extra time and cost involved in painting and firing the glass usually prevented its use in home or business architecture. 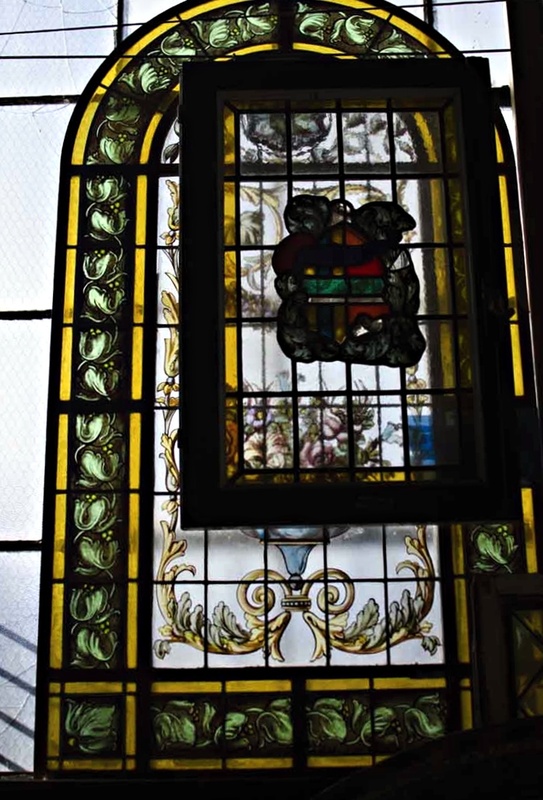 Unlike stained glass windows which are traditionally pictorial or of elaborate design, traditional leadlight windows are generally non-pictorial, containing geometric designs and plant motifs. 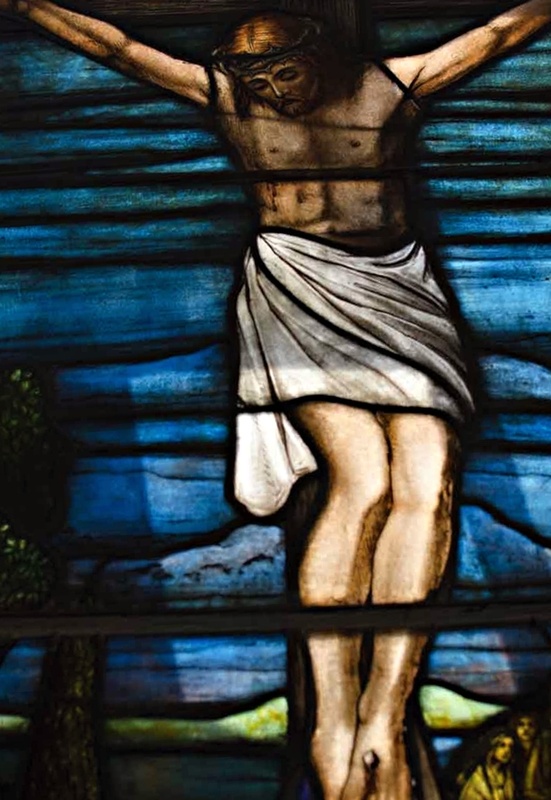 Stained glass, as an art form, reached its height in the Middle Ages when it became a major pictorial form used to illustrate the stories of the Bible to a largely illiterate population, where it also became known as the Poor Man’s Bible. 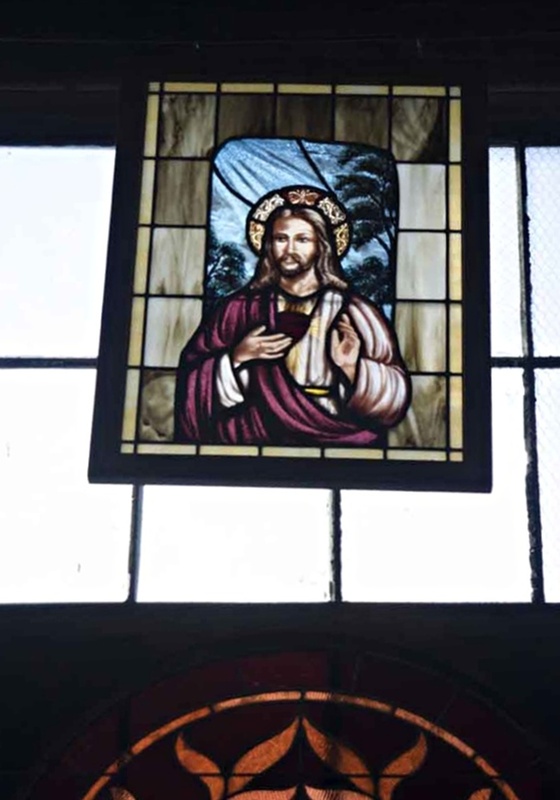 The use of stained glass continued through the years, gaining and losing popularity as styles changed. It regained popularity again in the late 1800’s, during the Victorian period, as there was a renewed interest in Gothic style architecture. 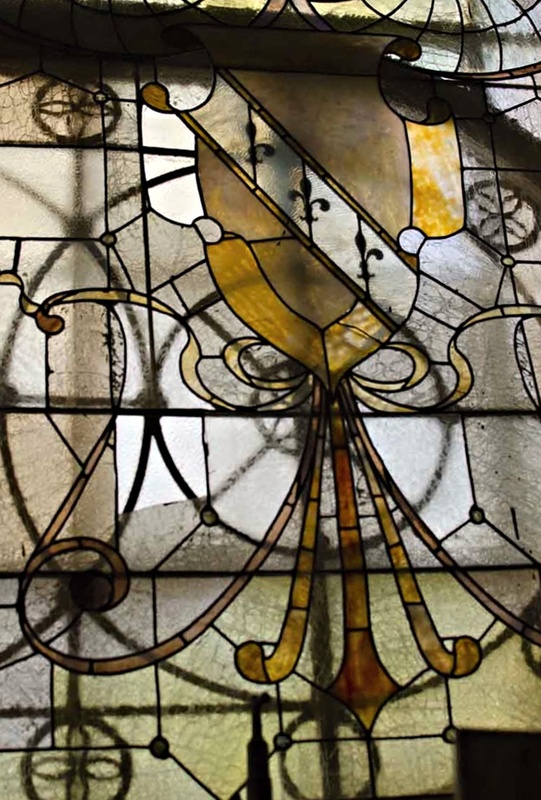 The Arts and Crafts Movement also helped revive interest in stained glass, mostly through its ideas of traditional craftsmanship and the use of medieval, romantic, or folk styles of decoration. 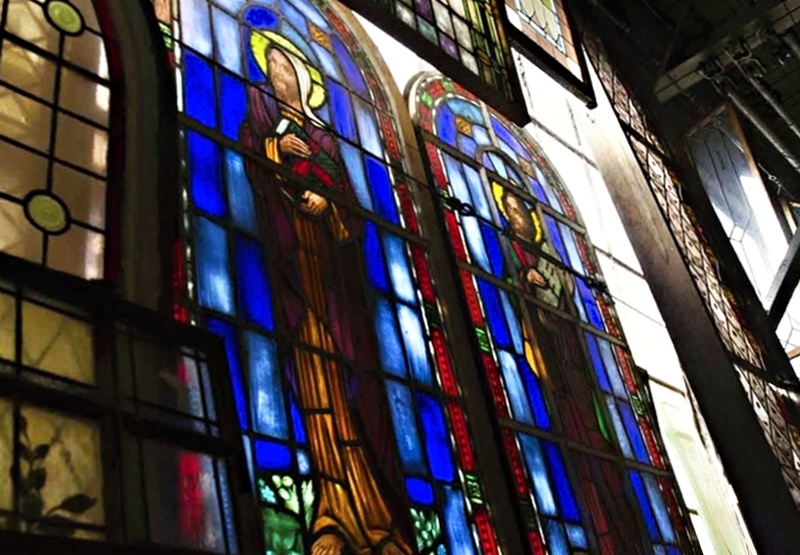 Artists such as Louis Comfort Tiffany (of Tiffany & Co.) developed new styles and techniques of stained glass making, elevating the art form to new heights. 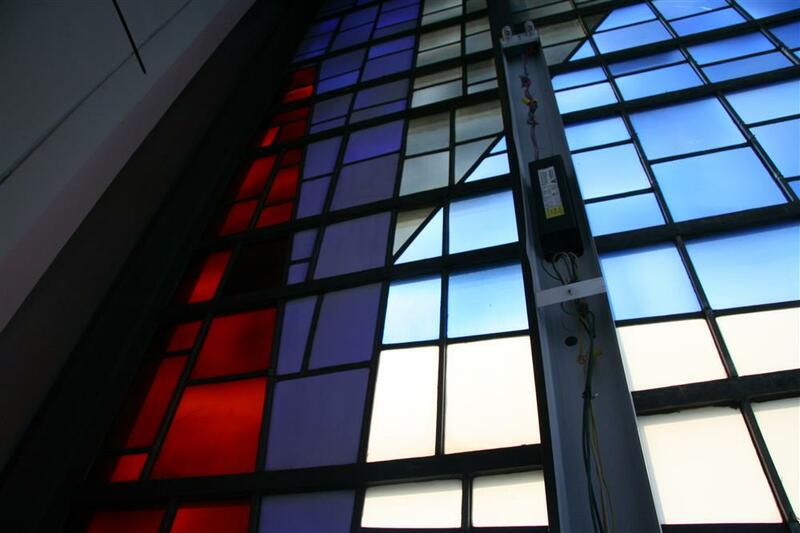 Today, both leadlight and stained glass are used in commercial and residential properties, helping to create intricately lit rooms with vibrant colors. 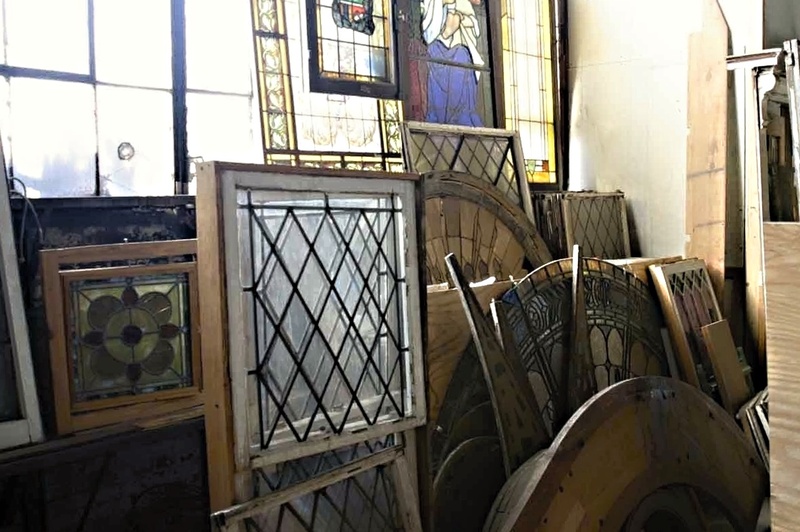 Olde Good Things has always enjoyed salvaging stained glass whenever the opportunity arises. 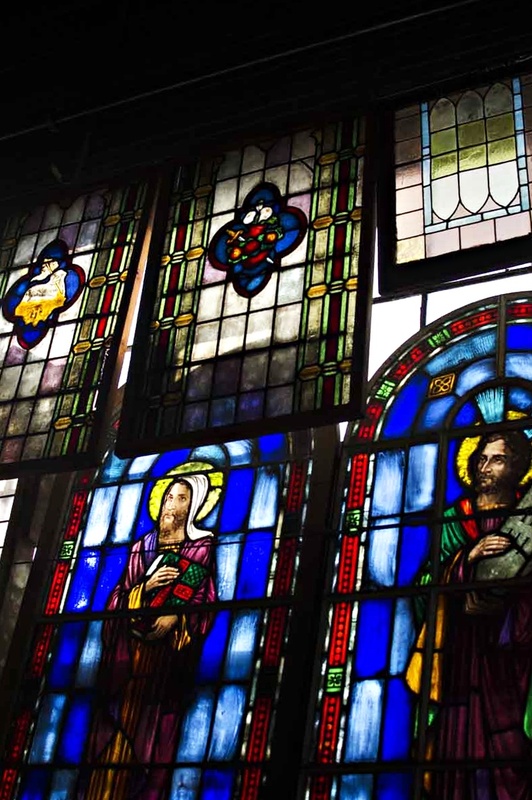 These stained glass pieces have come from churches, businesses and homes and come in a variety of shapes and sizes. 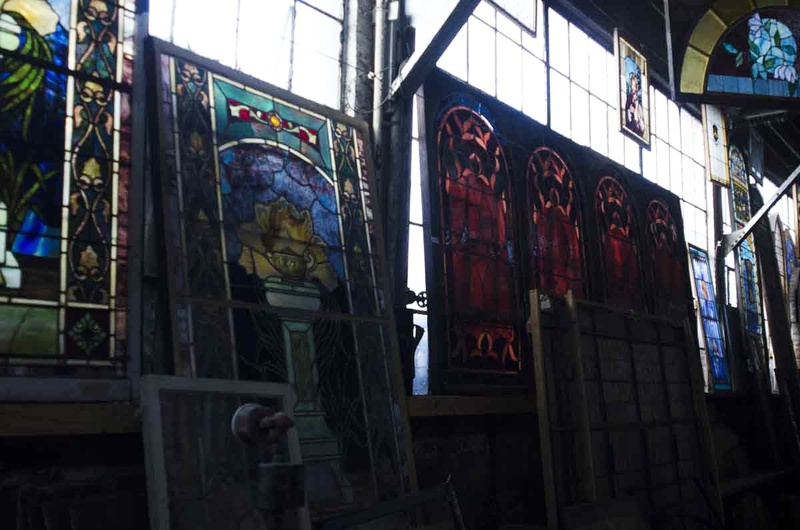 Fanlights, windows, doors with stained glass and more are available in the vast stained glass area at the warehouse at Olde Good Things. 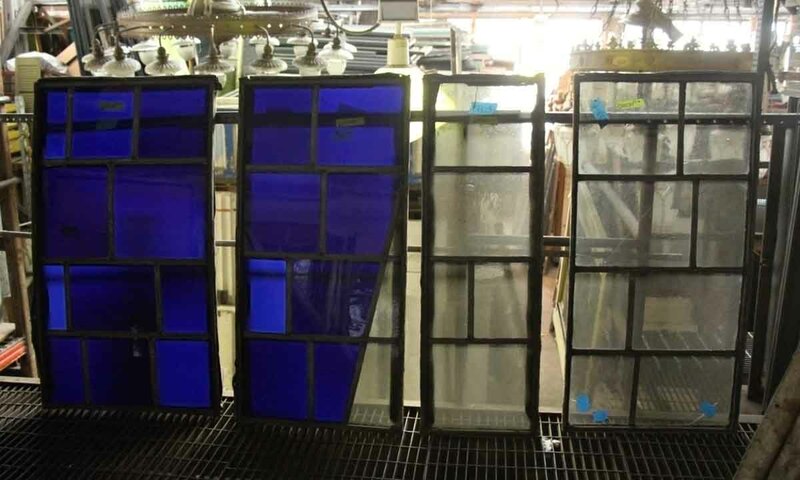 We also inquired an extensive stock of large single pieces of replacement antique stained glass, in every color you can think of. (please view this video for more information). 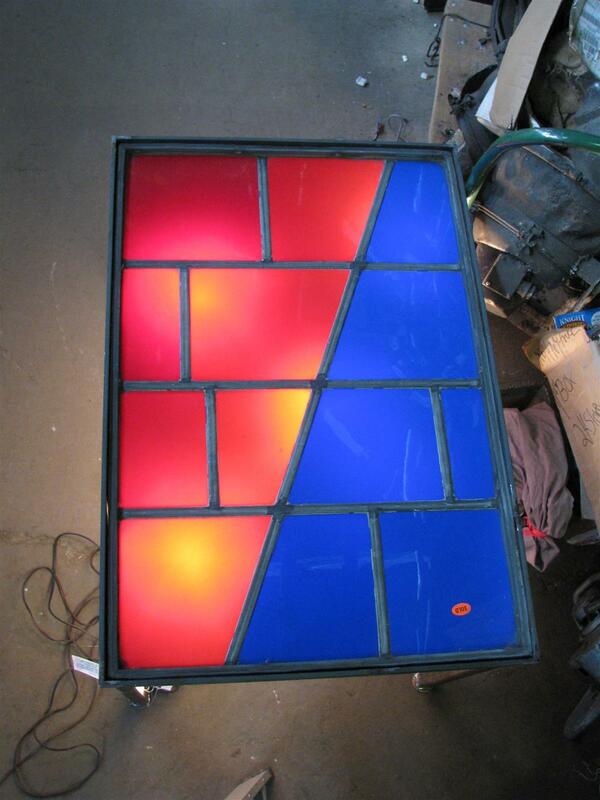 These pieces are perfect for any stained glass repair craftsmen or artist, wholesale pricing is available. Please inquire for more details. 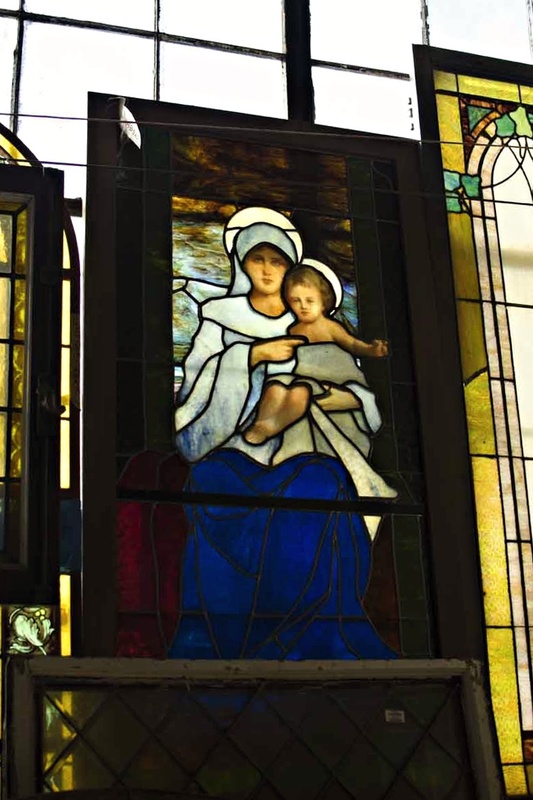 Our stained glass pieces sell incredibly quick, so be sure to stop by our Scranton, Pennsylvania location or view the Antique Stained Glass currently online. 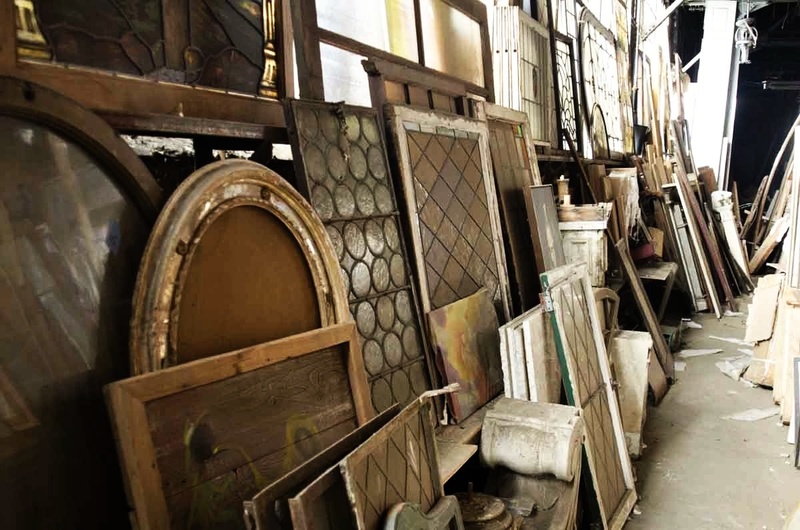 Anyone involved in even the simplest restoration, often finds themselves in search of original vintage glass perhaps for a broken glass door panel, or even an upgrade to a farmhouse chic look for their kitchen cabinetry and finds themselves searching for sources of this hard to find commodity. Olde Good Things has been reclaiming chicken wire glass for years from many old factories and buildings and has become a reliable source for various styles of this unique architectural element. 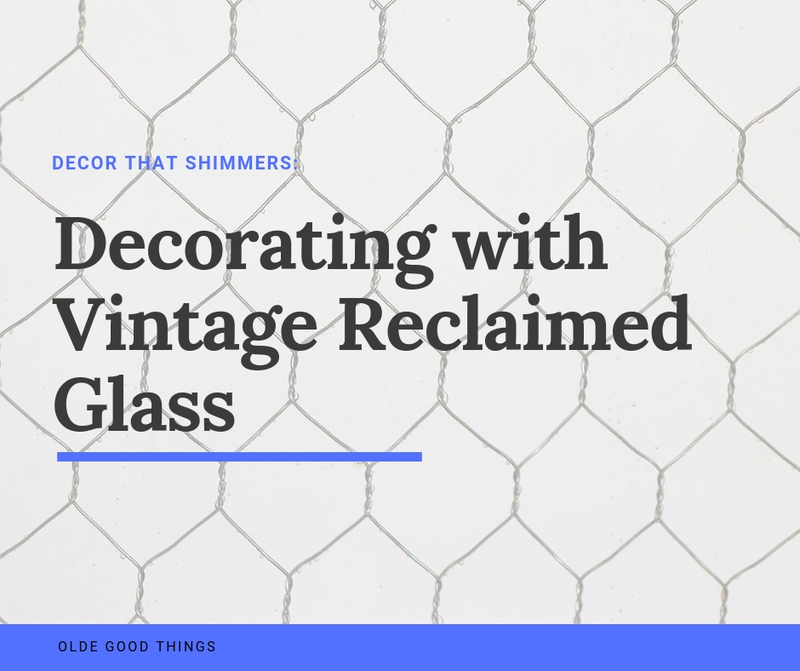 Rescued from the dark depths of famous, industrial sites throughout the United States, our vintage chicken wire glass has character and history. 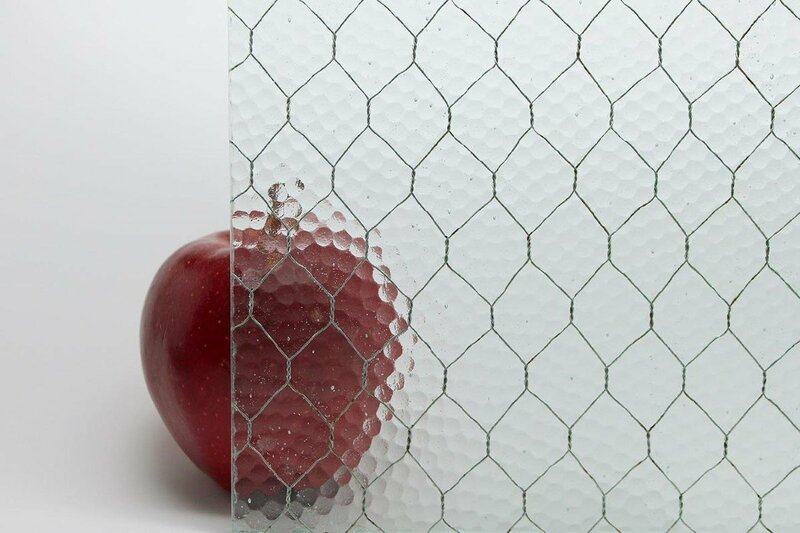 With durability that doubles in comparison to regular glass, chicken wire glass, also known as safety glass, is also shatterproof, making it perfect for those notorious cabinet slammers in your house. 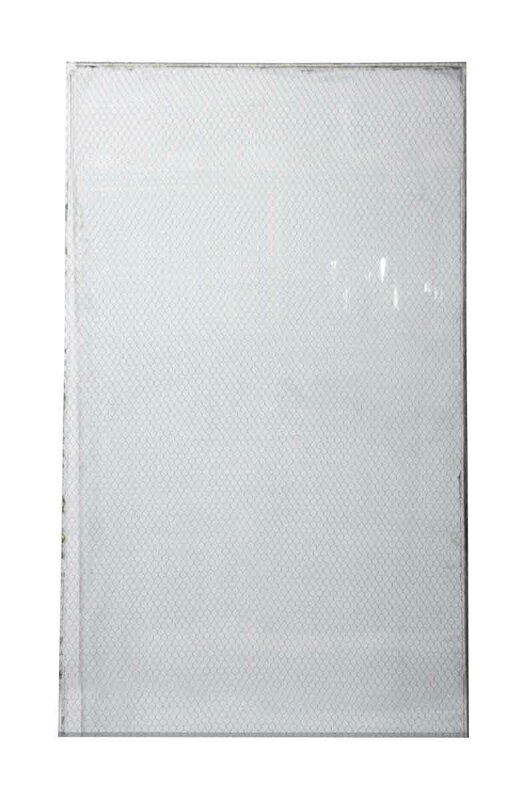 Chicken wire glass works especially well when used for wine cabinets and china cabinets. 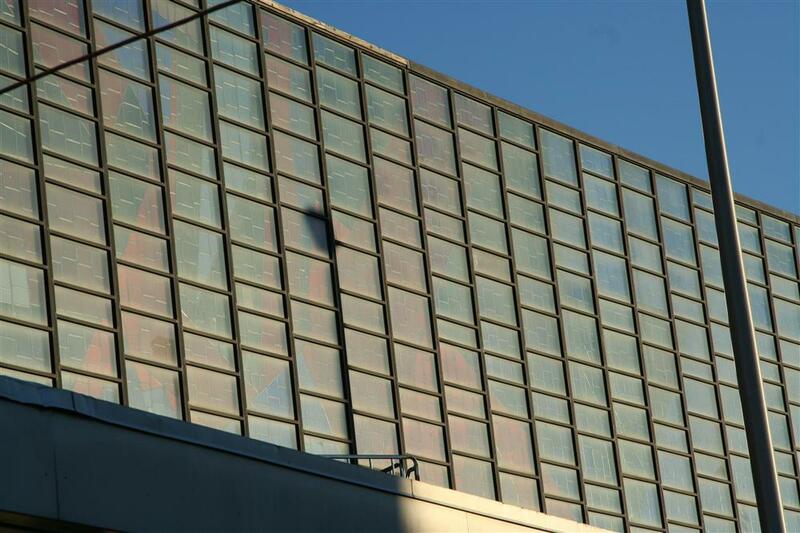 This glass intercepts over 99% of ultraviolet rays, protecting wine from rancidity and family heirlooms and pictures from discoloration caused by exposure to direct sunlight. 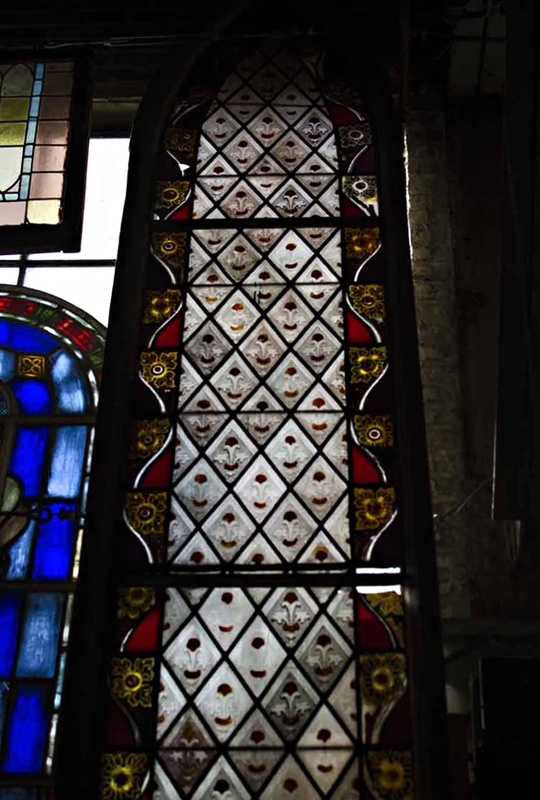 Thus we have made it one of the top salvage priorities to reclaim this glass and make it available once again for public use. 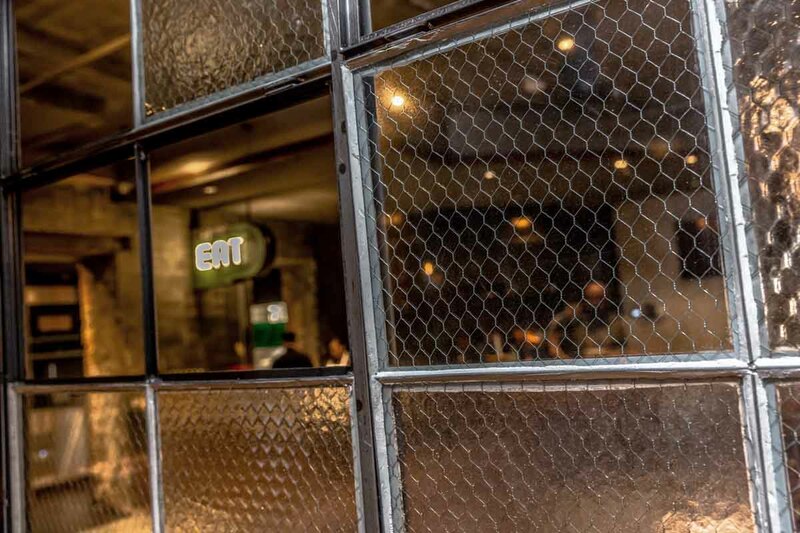 Our customers from Cata Restaurant has found their own ways to highlight clear chicken wire glass in their business, view below! We also have an unusual offering of oversized sheets 53 in. W x 81.75 in. H to cover large areas. 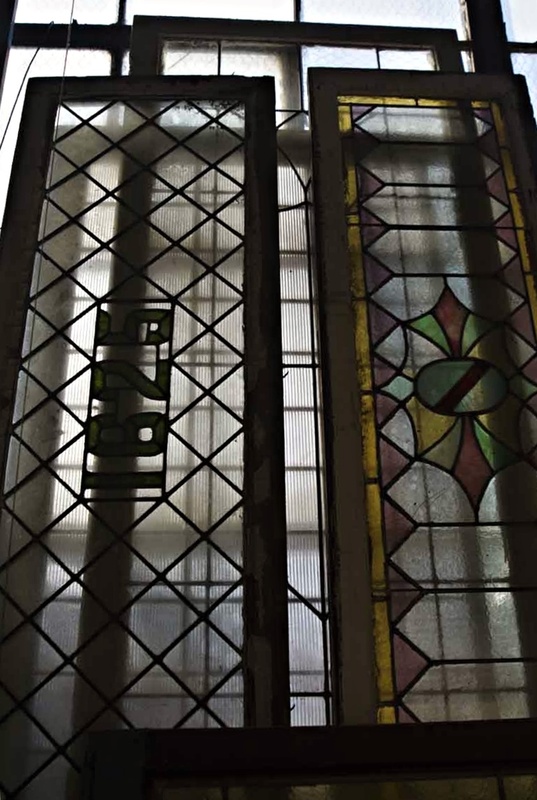 As many architectects and designers know who shop for vintage glass, large sheets of glass are quite a serendipitous find. 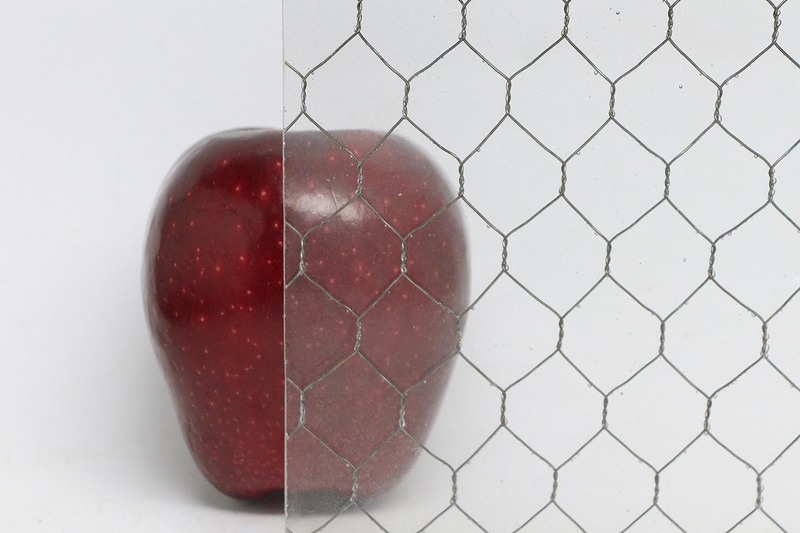 For the first time ever, we are offering Clear Chicken Wire Glass 25 % off which formulates it to $30 a square foot. As stated, sizes range in sheets up to 53 in. W x 81.75 in. H. and we will gladly cut to specific size requirements at no additional charge. 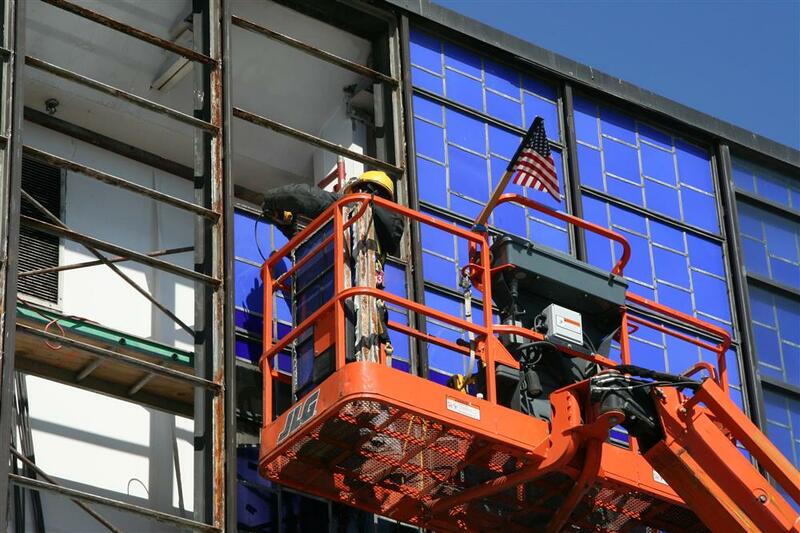 Please view online below or call to get your quote for your next project, 888.233.9678. Over the years here at Olde Good Things, we mastered our unique silvering glass technique. 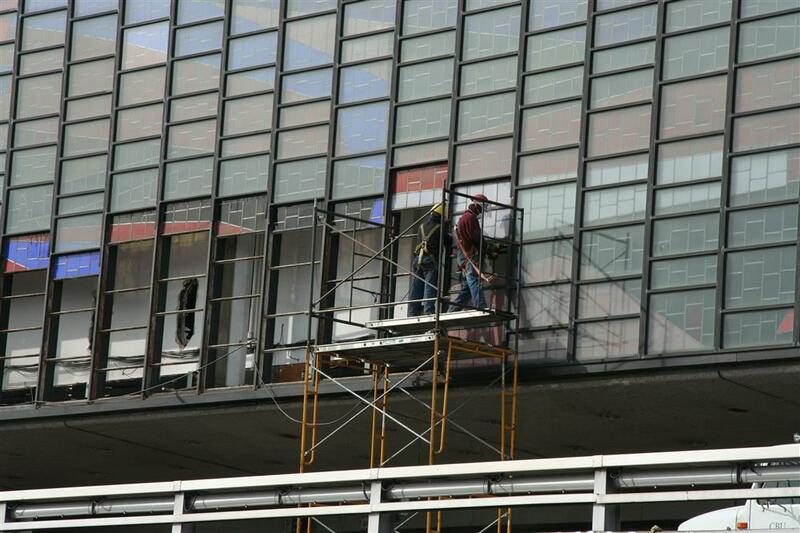 All the glass we use is 80-100 years old. 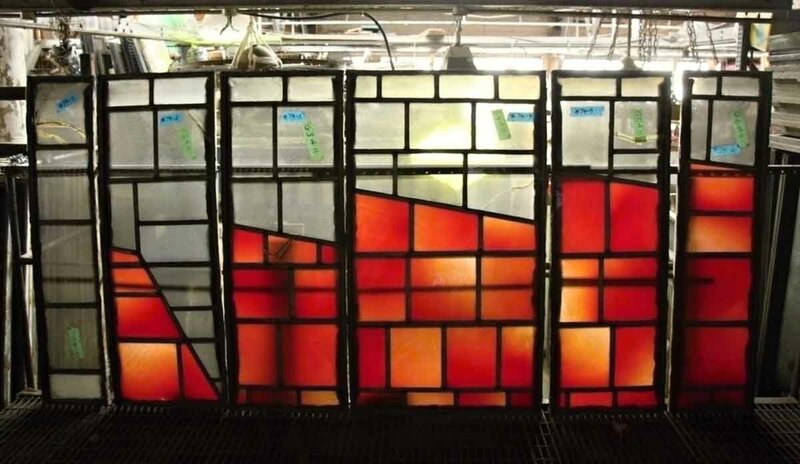 Get a glimpse on how our workers in the glass shop use this technique on a piece of reclaimed clear glass. 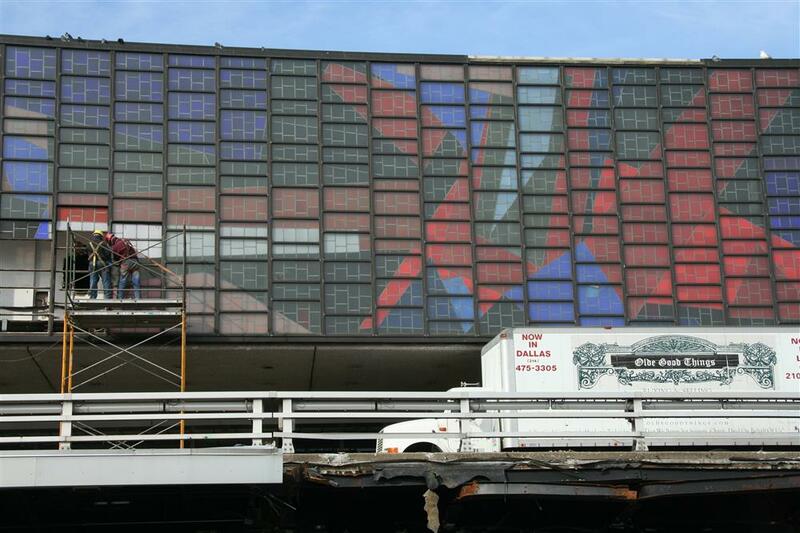 For more information call 888-233-9678 or visit www.oldegoodglass.com. 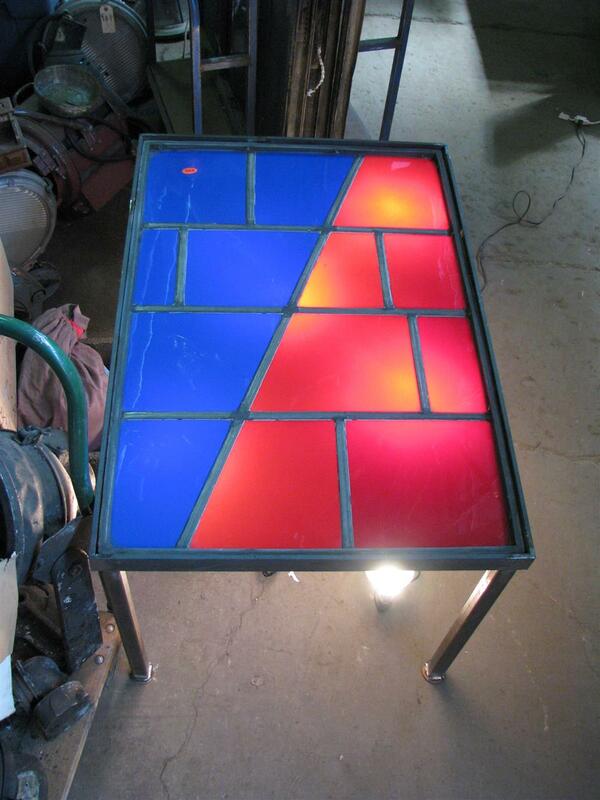 Request a silvered glass sample light, medium & dark at http://oldegoodglass.com/contact-us/. 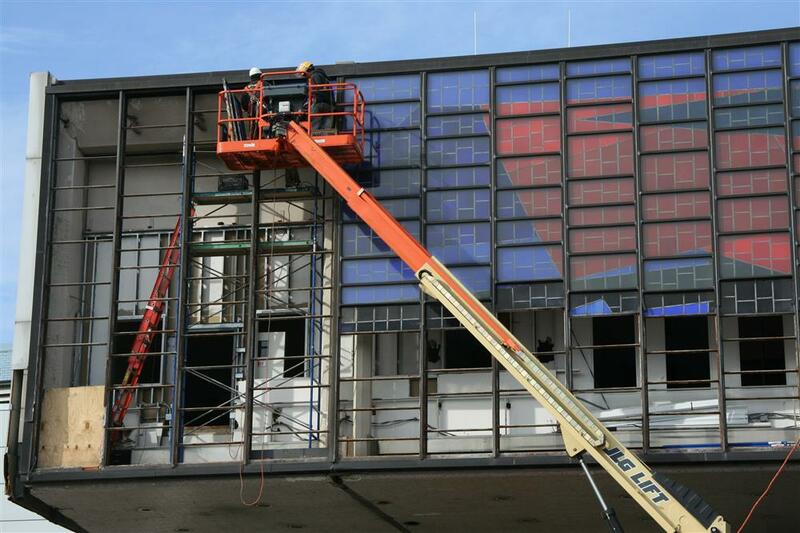 The architecturologists at Olde Good Things were able to carefully preserve a true landmark of history when they captured the famous stained glass window panels from JFK International Airport’s Terminal 8. 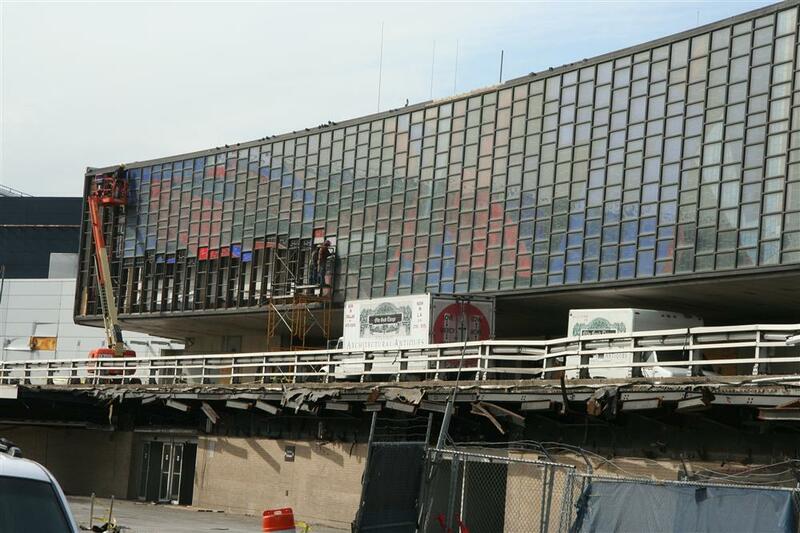 The terminal, fondly known as “The Cathedral”, was demolished in 2008 to be replaced by a modern steel-and-glass structure next door. 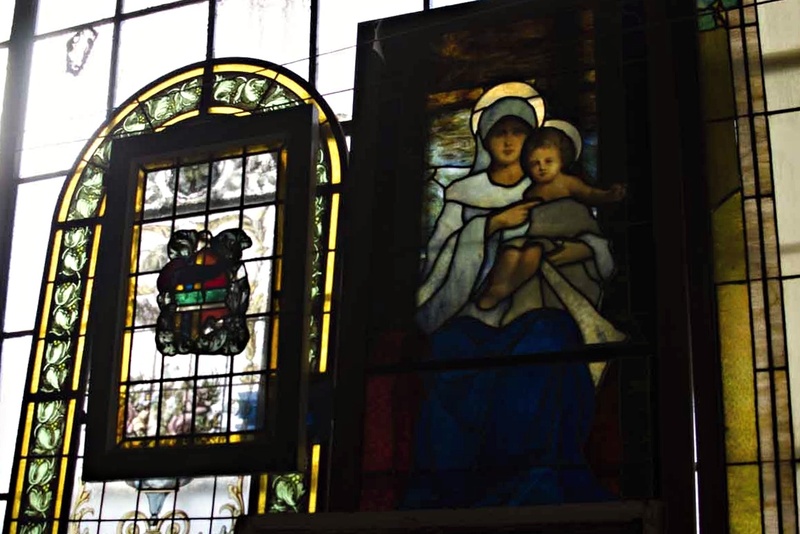 A discussion ensued over preservation of the original stained glass window unveiled in 1960. The New York Times article can be viewed here. 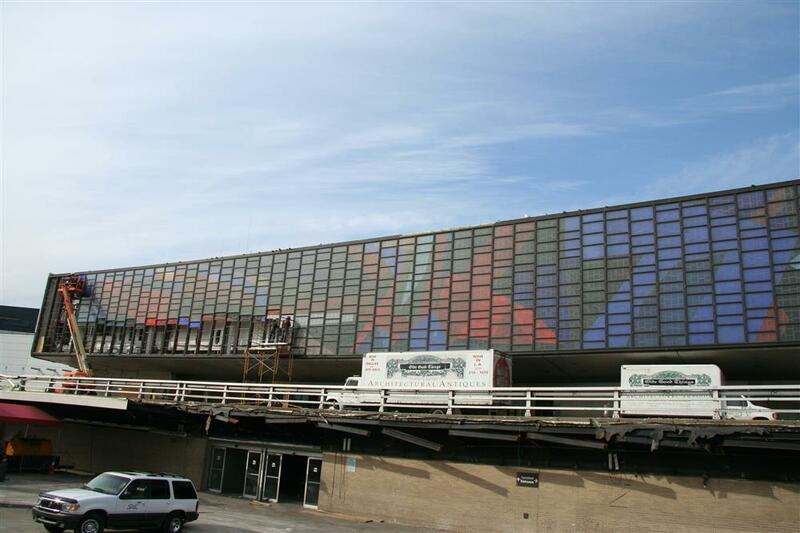 The 317-foot by 23-foot translucent mosaic panel facade was designed by Robert Sowers, who is considered by some to be the most iconic stained glass artist of the Modern Age. 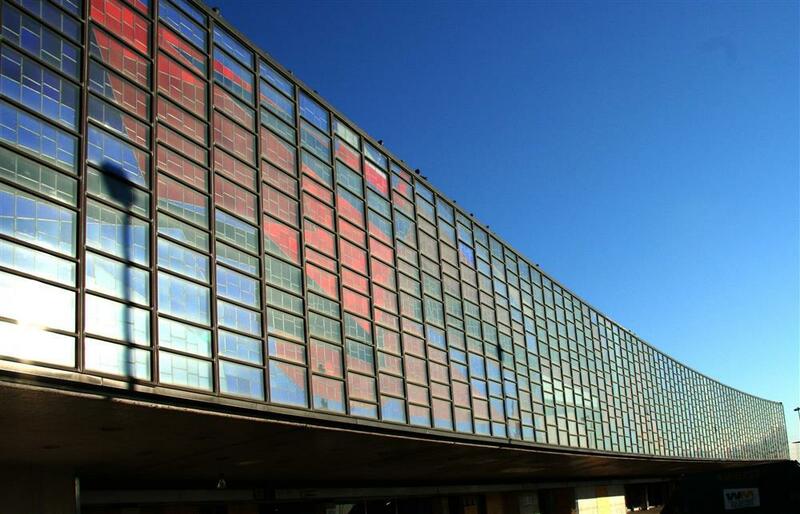 The piece was composed of over 30,000 flash glass tiles in vibrant red, sapphire, and white. 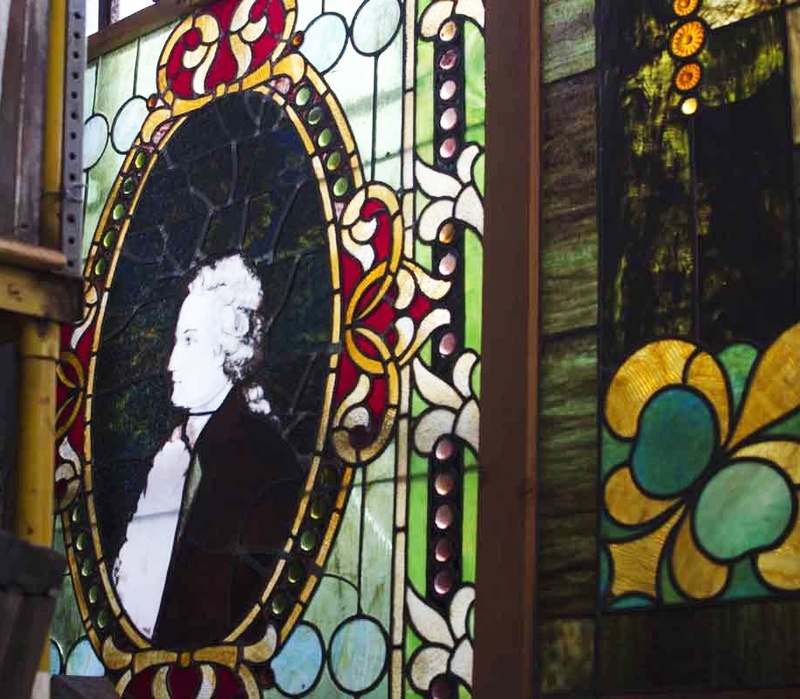 Sowers was one of the first artists to prominently feature stained glass in commercial architecture. 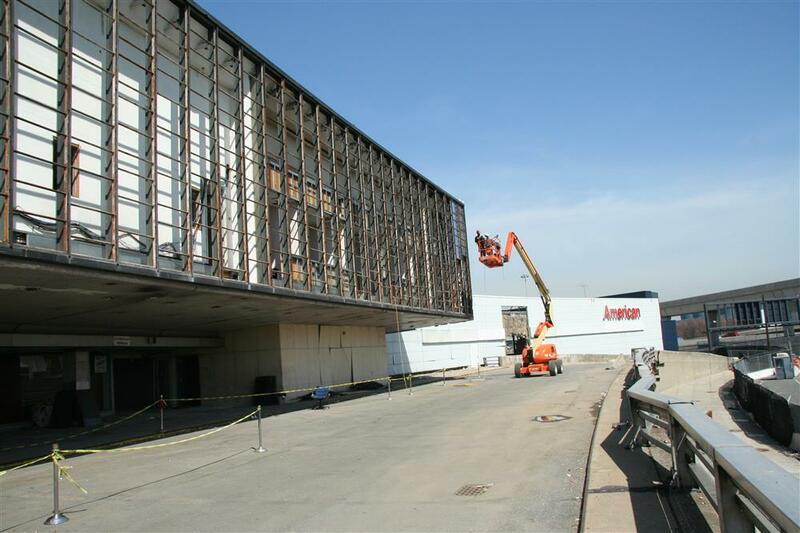 After searching for prospective new owners for the piece, American Airlines contracted with Olde Good Things to dismantle the panels and make them available for public resale. 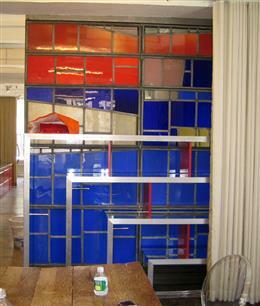 Other panels are housed in the Madison Museum of Fine Art, the C.R. Smith Museum in Dallas, and the Cradle of Aviation Museum in Garden City, New York. 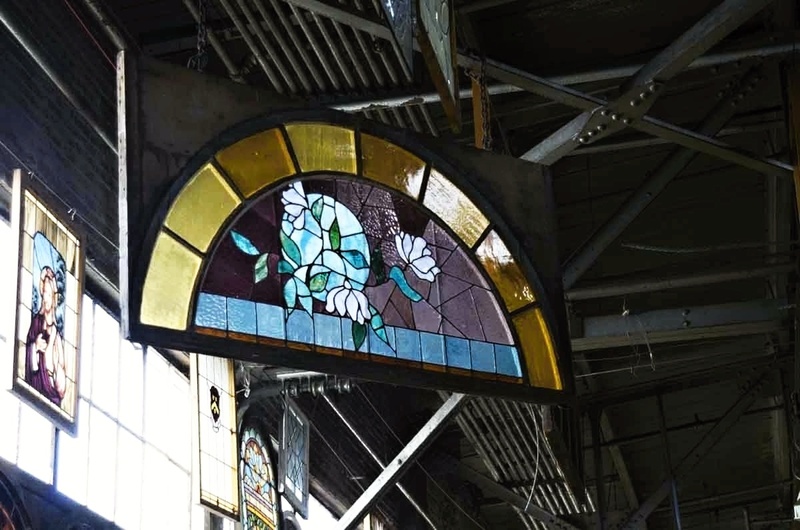 Terminal 8’s artistically and historically significant stained glass window panels can now be found among the other treasures of architectural salvage at Olde Good Things. 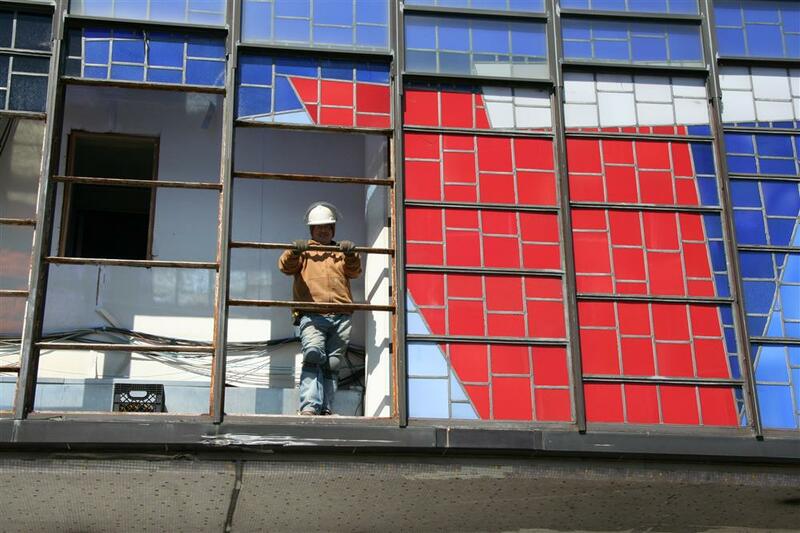 The OGT architecturologists carefully remove the glass from this iconic mosaic window. 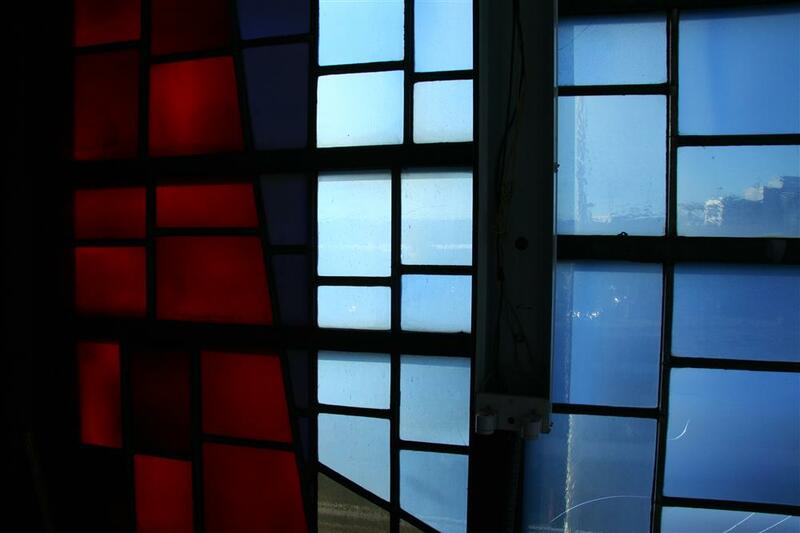 Startling ruby red, blazing citrine orange, and deep cobalt are among the hues that grace the stained glass window. The light shining through from behind is extraordinary! 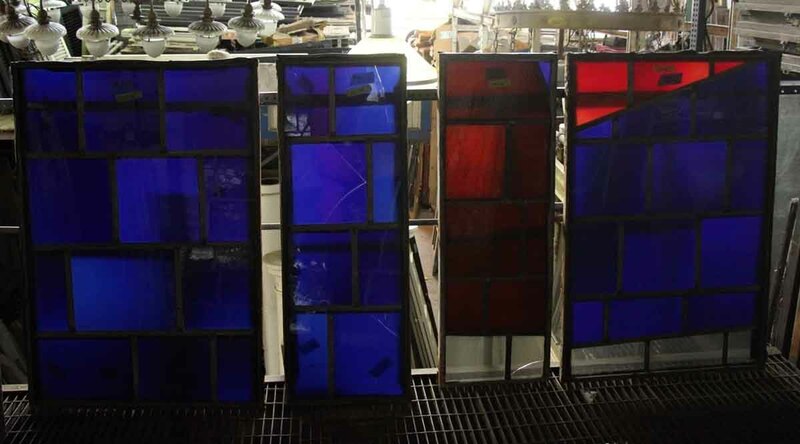 Our customers have used this exclusive reclaimed glass for a number of different applications, including privacy windows, for end and coffee table surfaces, outdoor entrance gates, or combined in order to create partition walls and room dividers. 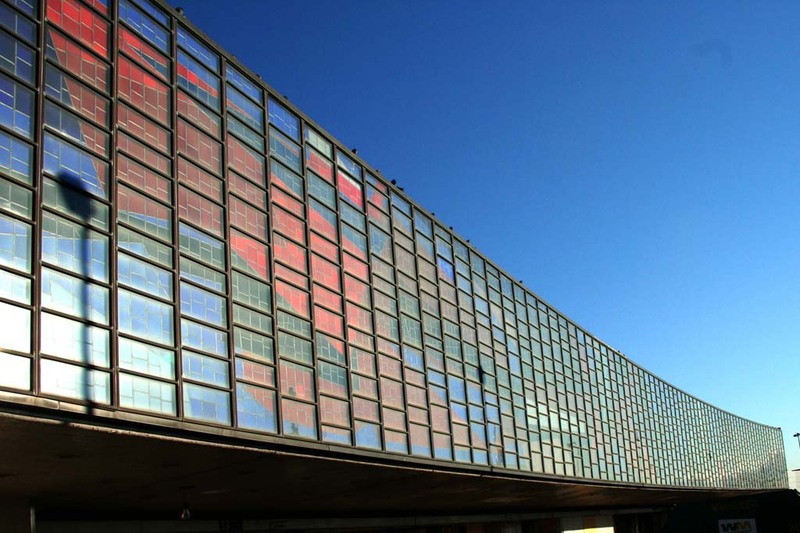 The bold colors of many of the panels make them ideal for contemporary environments, which include homes, offices and commercial spaces. Regardless of where you choose to put them, they’ll definitely create a statement. 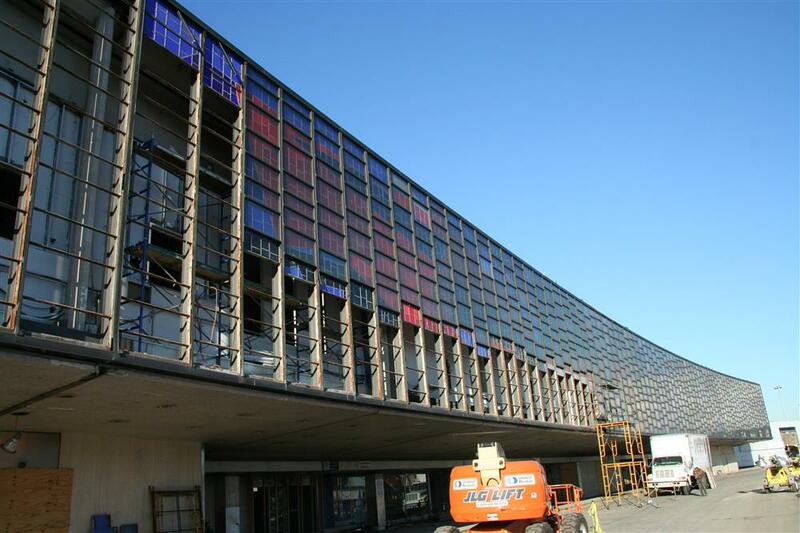 Of course, the ultimate positioning is an area where light can shine through, to maximize the amount of color that passes through the windows. 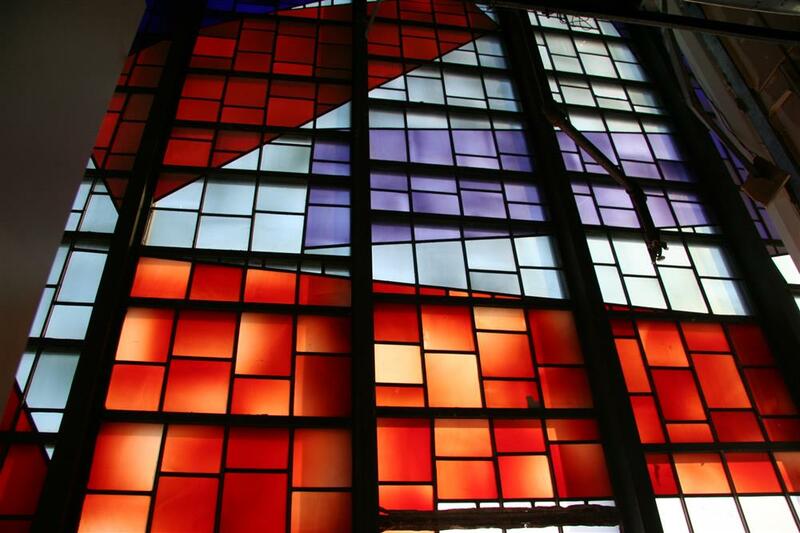 A number of our clients have incorporated American Airlines’ stained glass indoors and outdoors. 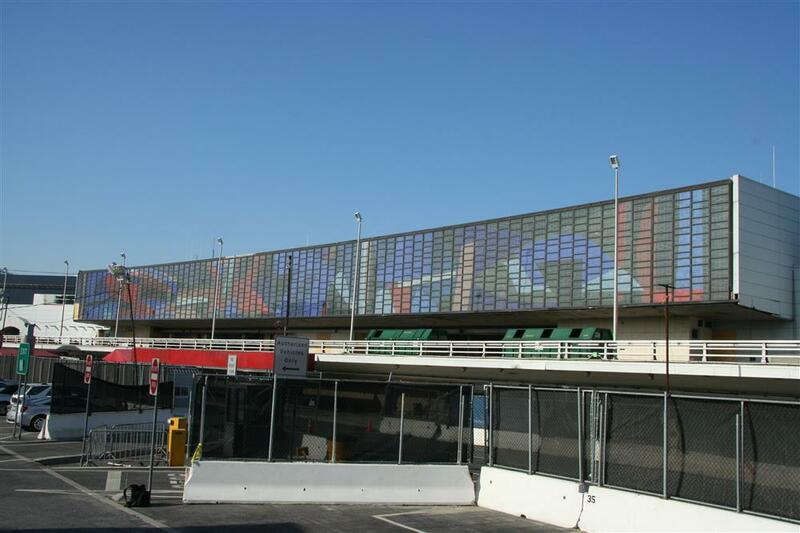 The JFK Terminal 8 glass can be purchased from OGT as a stunning glass wall panel, as smaller panels in a beautiful custom frame, or as souvenir panels measuring 8 in. x 6.5 in., 8 in. x 8 in., 10 in. x 10 in., or 12 in. x 12 in.. 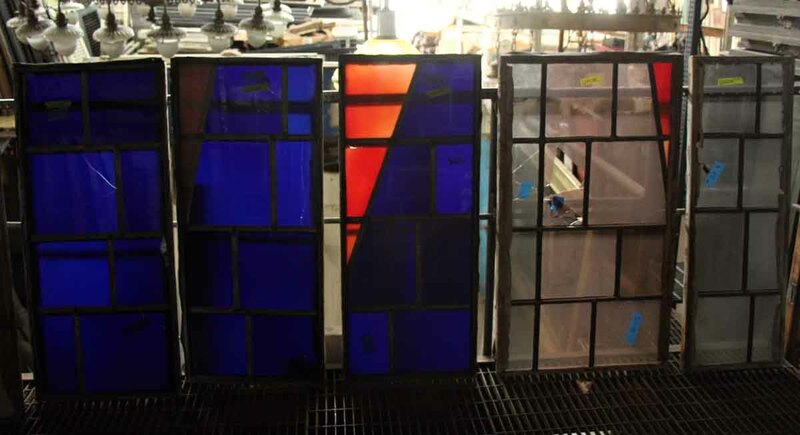 The panels pictured below are samples of the glass and may or may not be still available. Please inquire and if they are not available we will try and find you something in a similar color scheme. 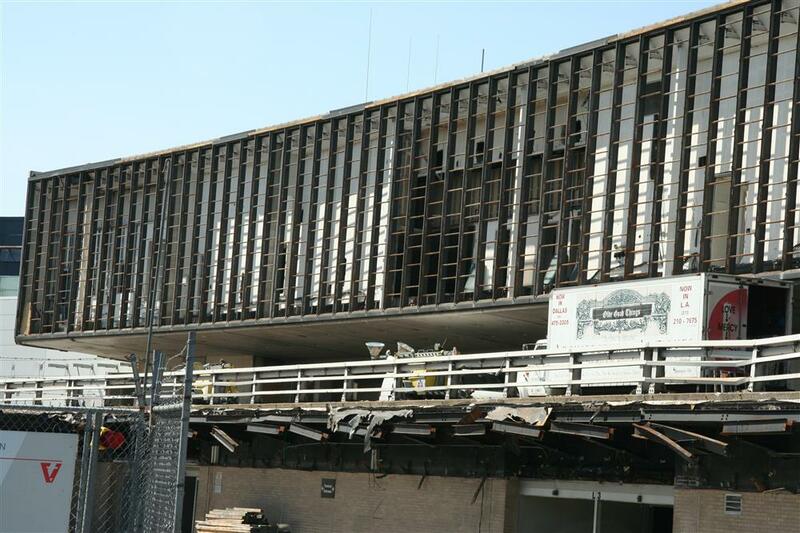 Each panel has some form of damage. 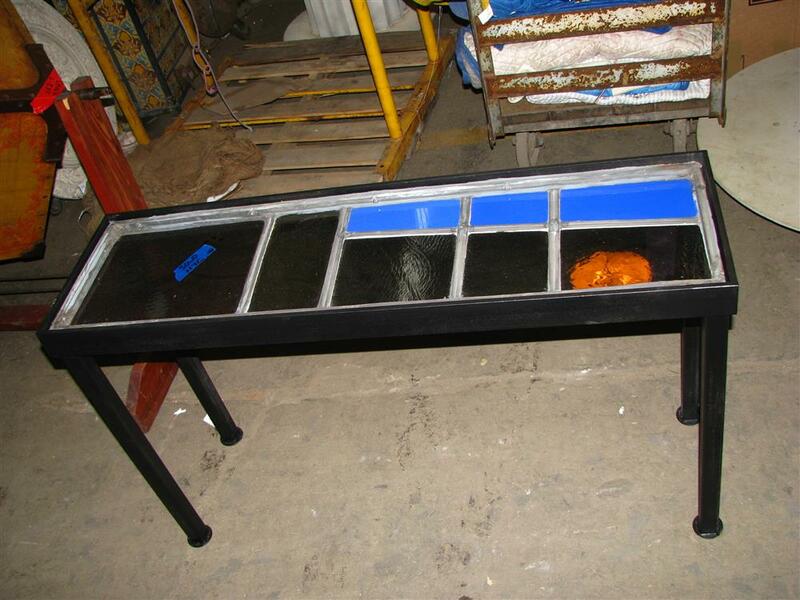 We can repair the damages in our warehouse glass shop. Call 888 233 9678 for more details. Call 888 233 9678 regarding L210112. Call 888 233 9678 regarding L210156. Call 888 233 9678 regarding L210287. Call 888 233 9678 regarding L210288. Call 888 233 9678 regarding L210289. 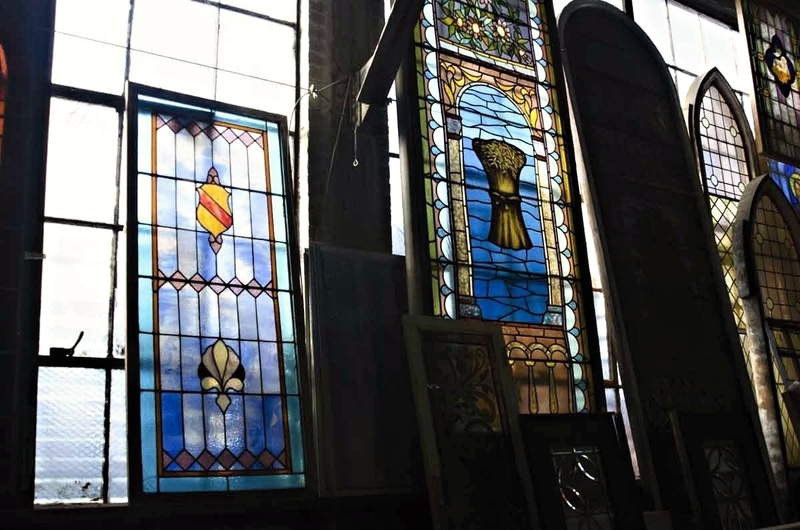 This picture depicts the entire window and which stained glass panels are still available for resale. All the panels marked with an “x” have already been sold. 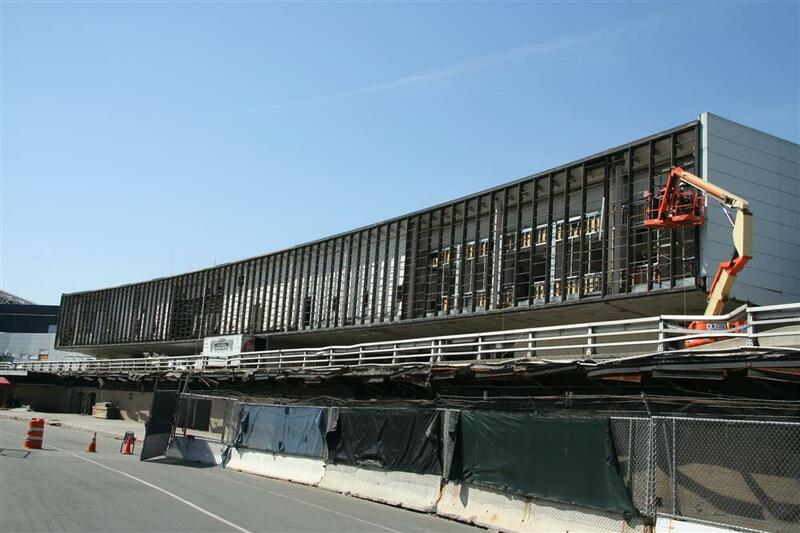 Learn more about this salvage project, visit here. 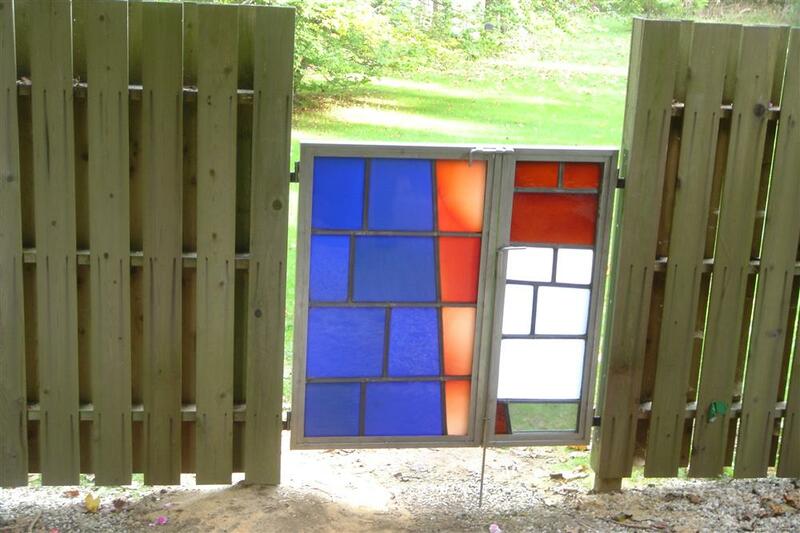 Learn more about other types of salvaged glass available, visit here. 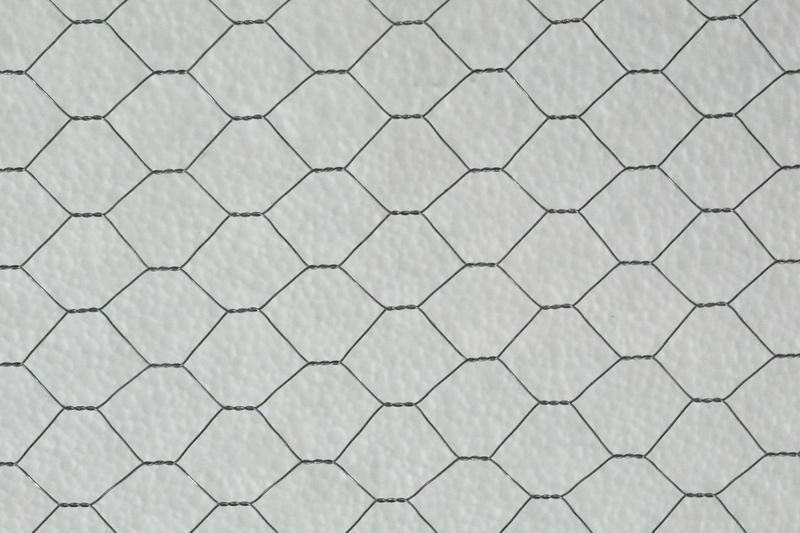 Though its manufacture has slowed in the United Sates, glass embedded with chicken wire has long been regarded, particularly in the world of industry, for its endurance and practicality. 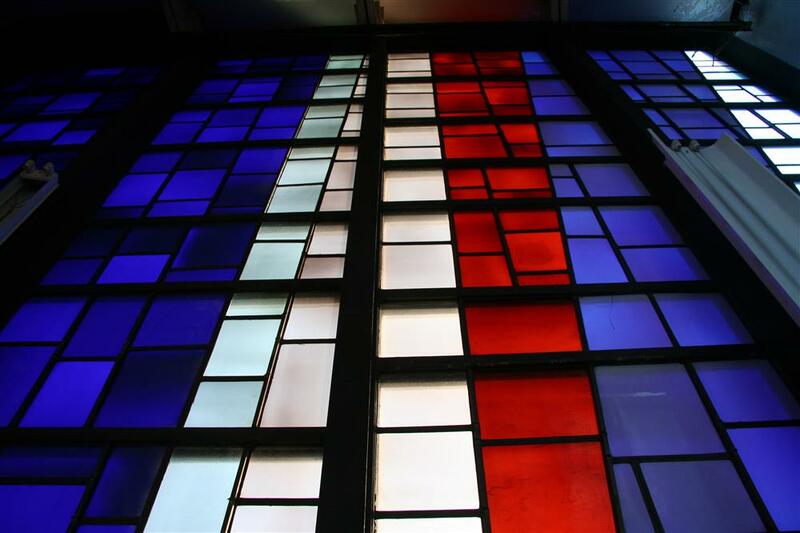 Its strength made it an ideal safeguard. It became a staple in factories, where its sturdy, shatter-proof quality kept workers inside safe and insulated from outdoor conditions. The strength of the material also bestows it another prized characteristic: versatility. The sheer variety of texture with which it can be imbued lends itself to a gradient of design function and aesthetic. 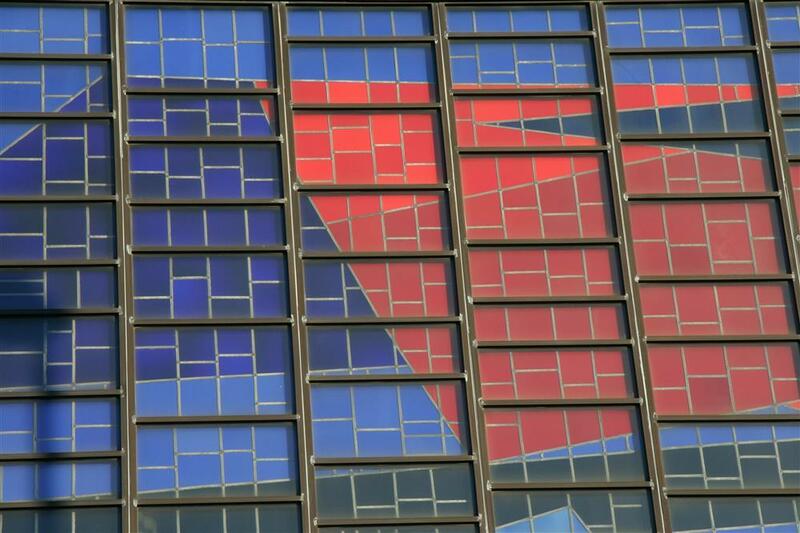 This texturing creates the effect of a mosaic: a stained glass window refracting pattern rather than color. 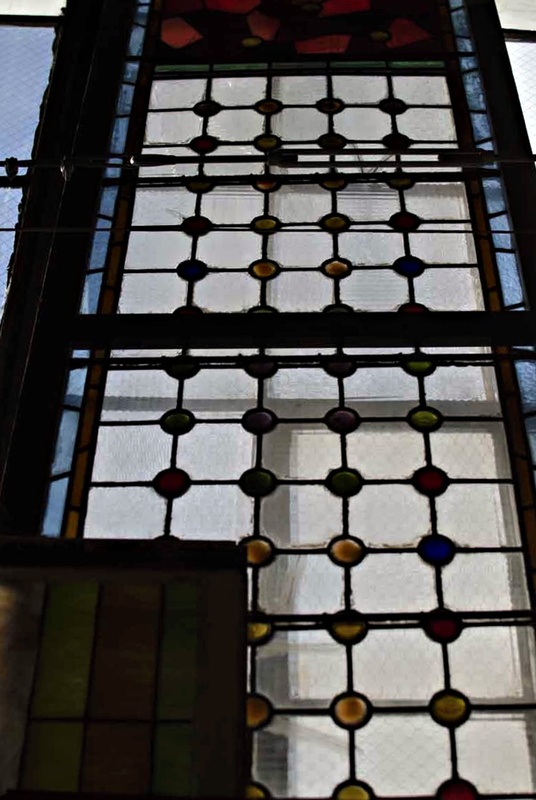 OGT has been salvaging this glass for years and in particular acquired a lot of the pebbled chicken wire glass, recently incorporated into a furniture design project, from a large factory in central Pennsylvania. 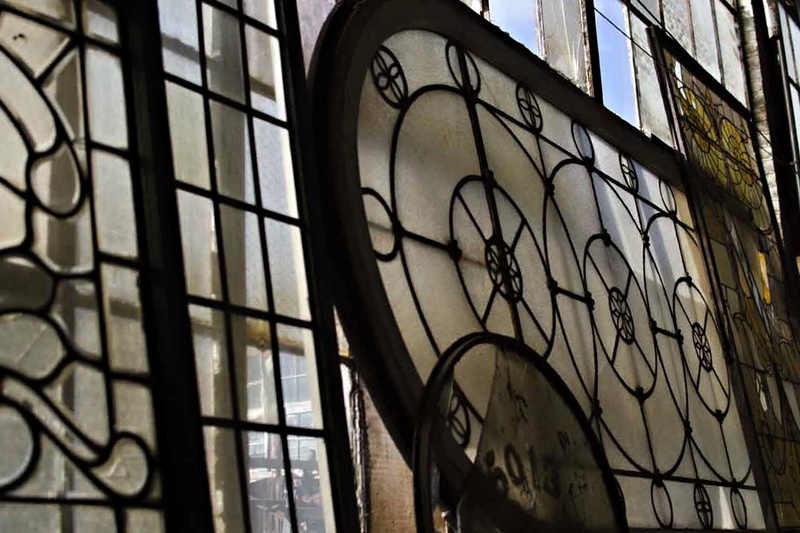 In its time it was used as a skylight for the industrial powerhouse. 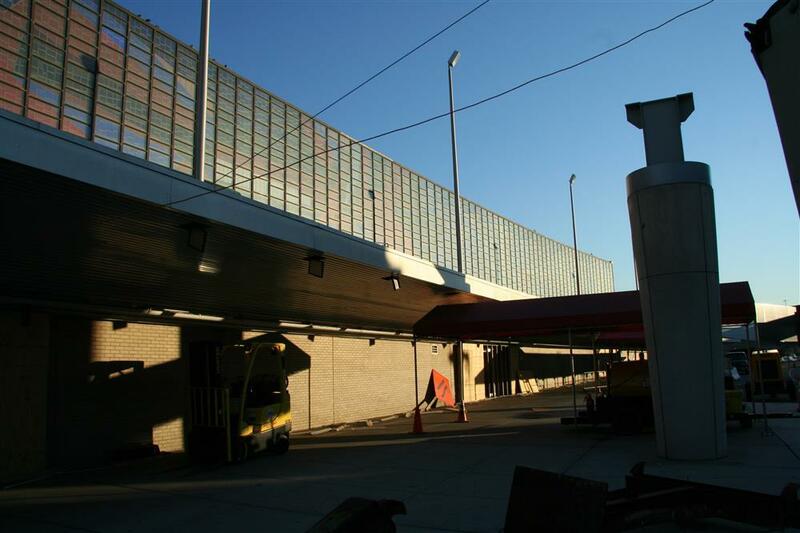 It filtered in natural sunlight from a height of eighty feet above the factory floor. Its opacity brings to mind both the billowing haze characteristic of the industrial area, and the subtle beauty of a soft sunbeam. 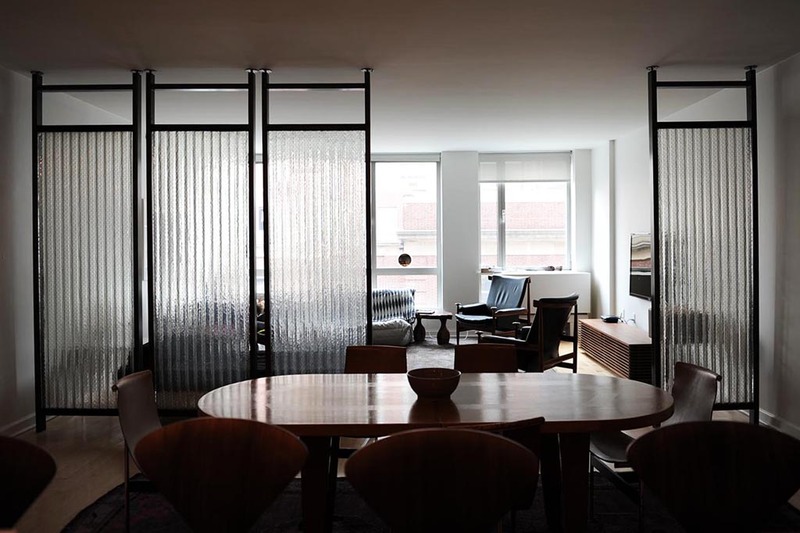 Turn the clock nearly a century forward, and that same pebbled, chicken-wired glass is salvaged, restored, and put to use in a contemporary New York City loft. Enter Union Studio, a small business based in Berkley, California, whose specialty lies in interior design and furniture craftsmanship. Each furniture piece, designed by company founder Matthew Bear, is custom built and crafted with utmost quality in mind. For a company with such a claim to the aesthetic of the handmade, there is much thought, naturally, that goes into the material choice of each piece. 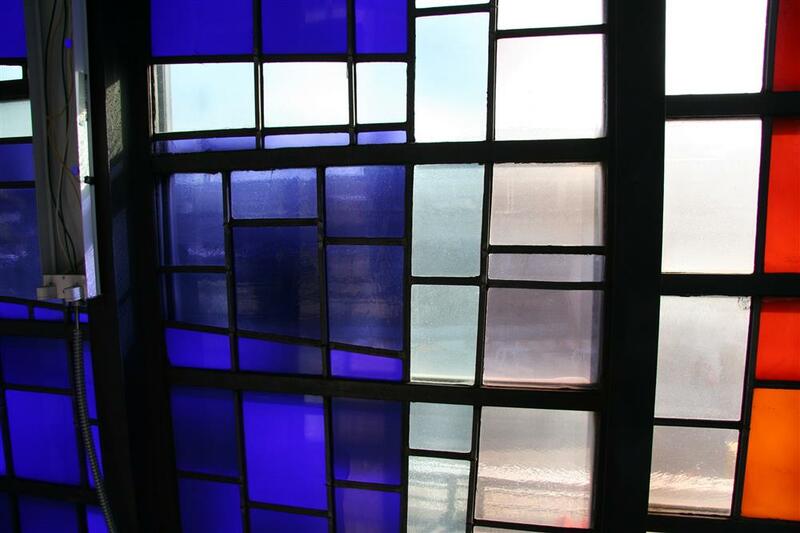 And this is where the multi-purpose nature of the factory-recovered glass comes into play. The panels were first put to use for the sliding doors of this shower. 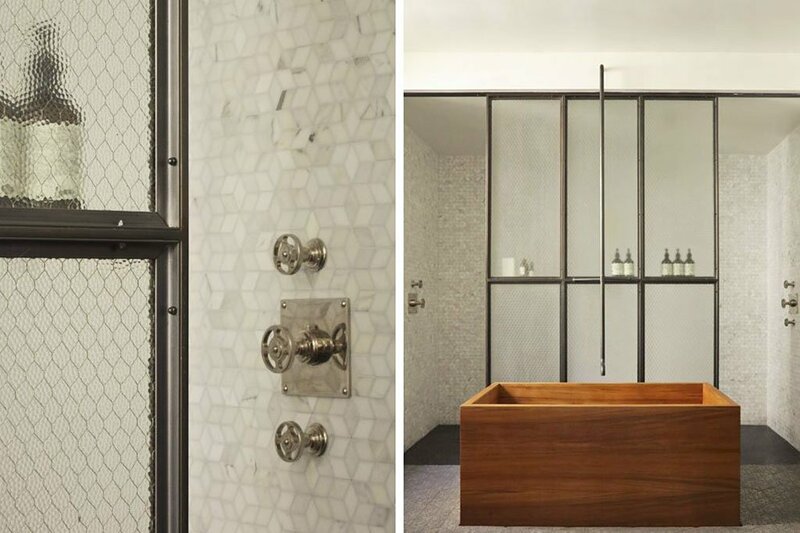 Here, the opacity of the pebbled texture offers the necessary privacy, and the embedded wiring provides the perfect design compliment to the metallic framing and shower handles. 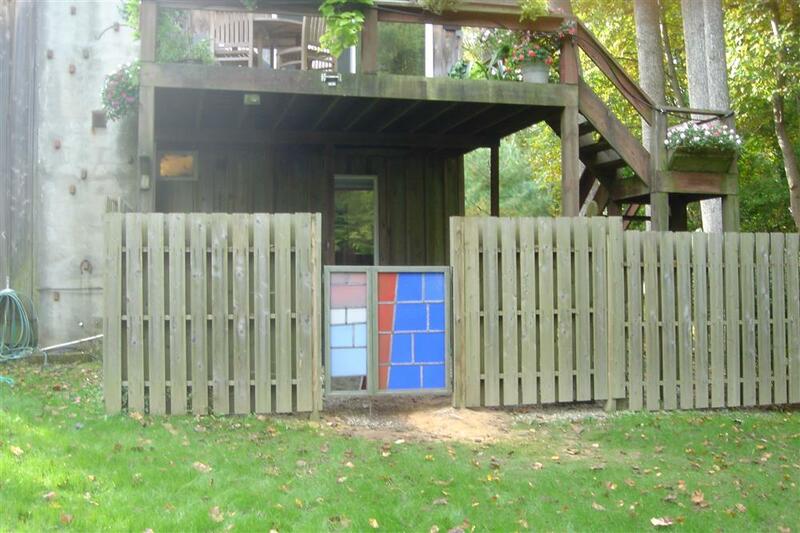 Vintage glass paneling between these door frames bridges one room to the next. The translucency of glass gives the loft a cohesive sense of space. Meanwhile, the texture simulates a patterned fog just thick enough to isolate each room from the other. 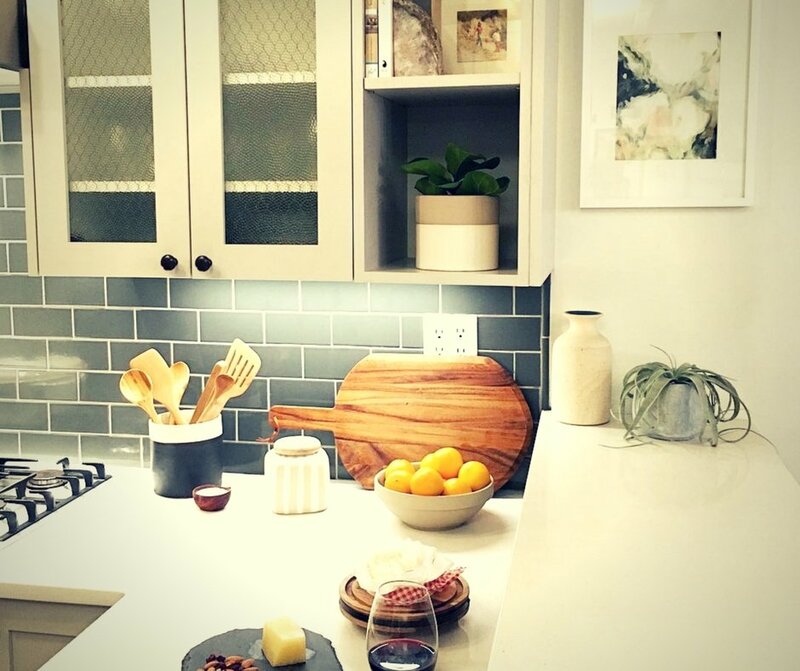 The metallic plating of the glass gives even this cabinet an industrial embellishment that is right at home in with the rest of this kitchen area. 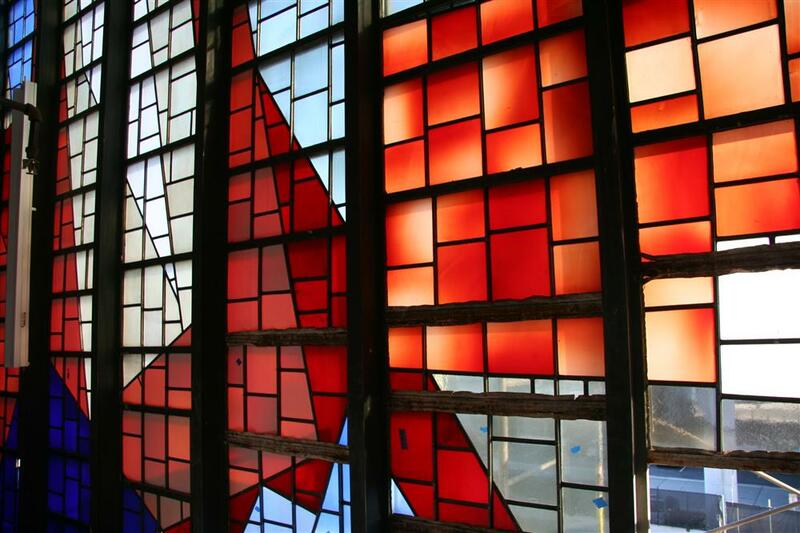 It’s remarkable to think that one piece of glass could branch out in so diverse a manner from its original purpose. What started out as distant skylight now becomes three distinct statement pieces that add cohesion and unification to the space through their shared material. 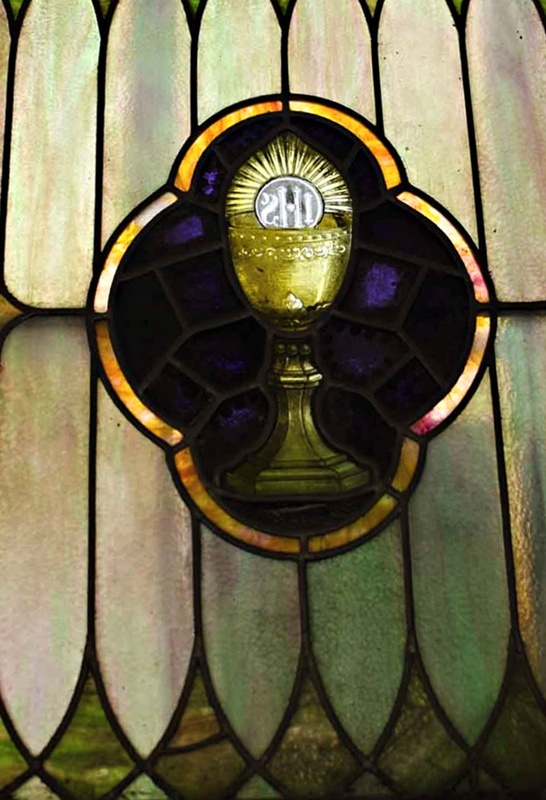 View more types of glass available.